In many ways, my senior year of swimming was the most challenging and most rewarding of my entire career. Granted, I no longer had to prove myself nor gain acceptance in a close-knit community (as I did as a freshman), but at least in the early years there were few expectations of me. 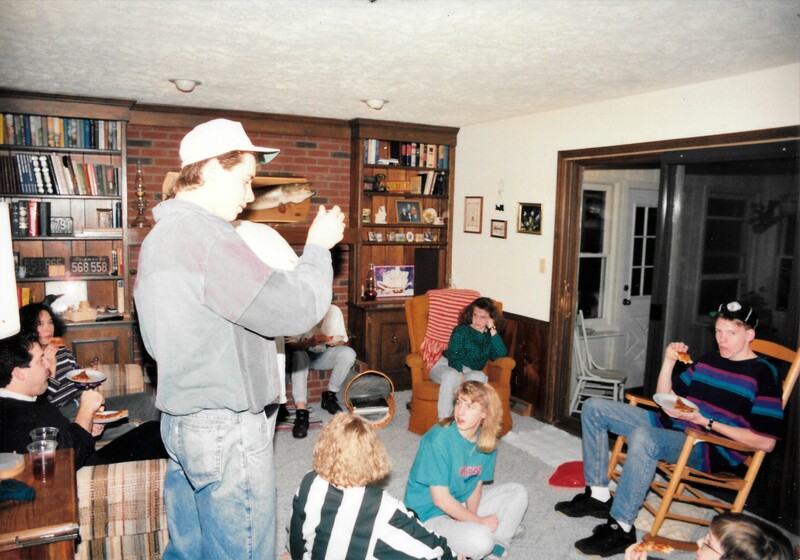 By the 1993 season, I had amassed quite a resume of accomplishments, and teammates had started to look to me for leadership. Winning had become an expectation instead of a goal. I was voted team captain along with junior Eric Forrester, one of my fellow state qualifiers from the previous year. As a junior, I was awarded the mental attitude award by my teammates. This confidence was reassuring, but also came with the internal pressure to validate that confidence. And for the first time since I started swimming, I no longer had Chris Clay and Mark Ullom to help me shoulder the burden of winning. Although I was looking forward to the season, I also knew it would be full of “lasts”. The last call-out meeting. The last fabled new-years workout. The last Sagamore Conference meet. The last shot at qualifying for state. I wanted to both enjoy each one of these “lasts” and get through them so as to not have to dwell on them again. There were external pressures as well. 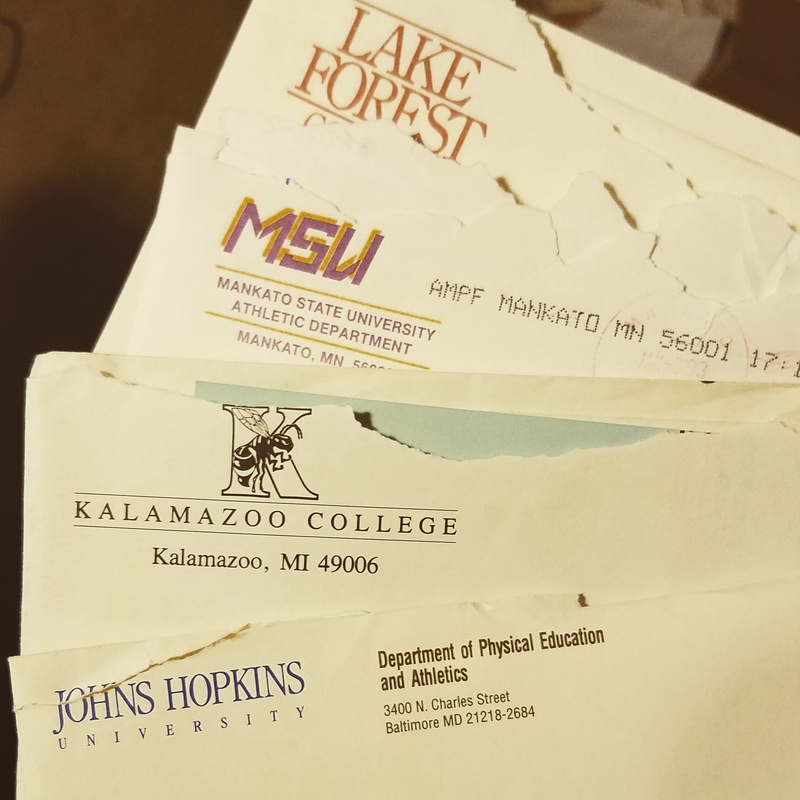 I was less than a year away from starting college, and was receiving attention from several smaller schools’ swim programs. I had my first serious girlfriend, and was struggling to navigate the social obligations that come with that type of commitment. Thinking back on it, the actual swimming part of my senior season was probably the easiest and most familiar aspect of that year! The other things – college, girlfriend – were decisions that could determine the course of my life for years to come. At least I knew what to expect with swimming. While it may have sometimes felt like it, I wasn’t alone. Although I never felt as close to the junior class as I did the seniors from the previous year, a couple of them had emerged as good friends and confidants. Mikey Ullom had chosen a locker adjacent to mine in the locker room, and was extremely supportive during my senior campaign. No longer the skinny little diver who had joined the team on a whim, Michael had emerged late in his sophomore season as a dangerous sprinter who helped our 200 freestyle relay team reach record heights. He called me “big brother Ben”, which is kind of funny considering that at 5’9” I felt like a hobbit when standing next to his 6’7” frame. But the sentiment was reciprocated, and even validated when I stayed at the Ullom’s house for a few weeks during the summer while my parents went on an anniversary trip. Through becoming close to both Mark and Michael, I kind of felt like part of the Ulllom family. My co-captain, Eric Forrester, was another who I could count on to work hard and rally the troops. Eric and I each fullfilled an important leadership role. I saw myself in the “Chris Clay” role, leading by example, while Eric could fulfill the more vocal “JP King” role. Besides me, the other returning senior on the squad was Jon Beard. 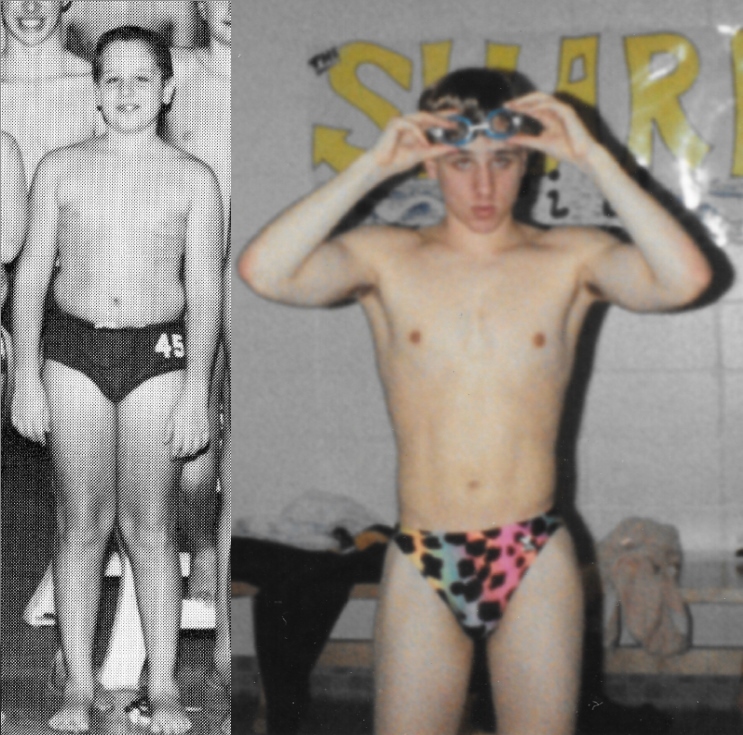 I had been friends with Jon for years, but he had only started swimming as a junior. Jon and I didn’t have the opportunity to swim together often, but Jon had a real knack for being able to tell when I was a little stressed out. While some of the younger swimmers may have been too intimidated to approach me at those times, Jon would plop down next to me, sit in silence for a few seconds and then crack some kind of joke to ease the tension. 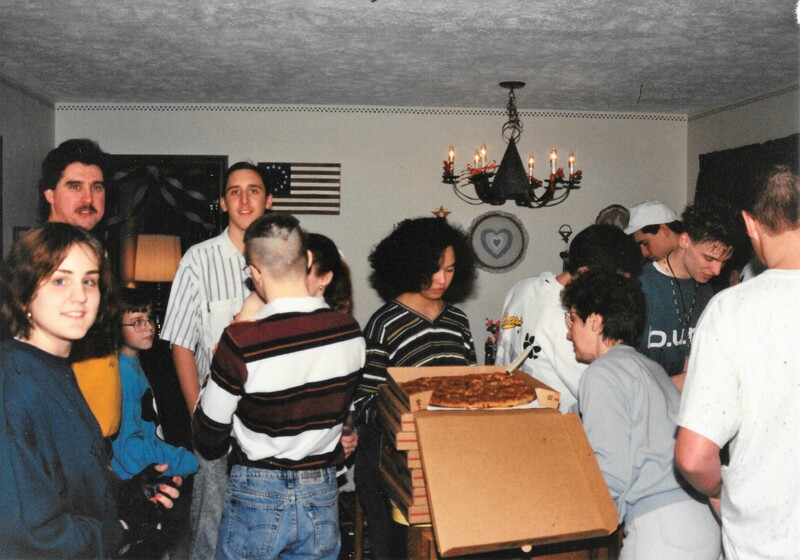 We had a large group of freshman come out for the team in 1992/3. We didn’t have any sophomores, so there was a bit of a gulf between those of us who were returning and the new Tiger Sharks. Due to this, there were some natural divisions in the team (two years is a long time when it’s the difference between a freshman and a junior), but my hope was that I could help to make them less pronounced than they were in 1990/91, when the current juniors arrived and attempted a coup of the upperclassmen. I wanted to be more inviting and accepting of the freshman class. I hope it showed. Among this class, one swimmer stood out as the true star: Adam Spray. Adam was not big, but it was obvious that he was far more advanced than any other freshman we’d seen to this point. He swam the butterfly, and he worked hard in practice. He took competition seriously. I liked him right away, and tried to take him under my wing as much as possible. It was apparent to me that Adam was the future of the team. He was going to have to learn how to lead whether he wanted to or not. 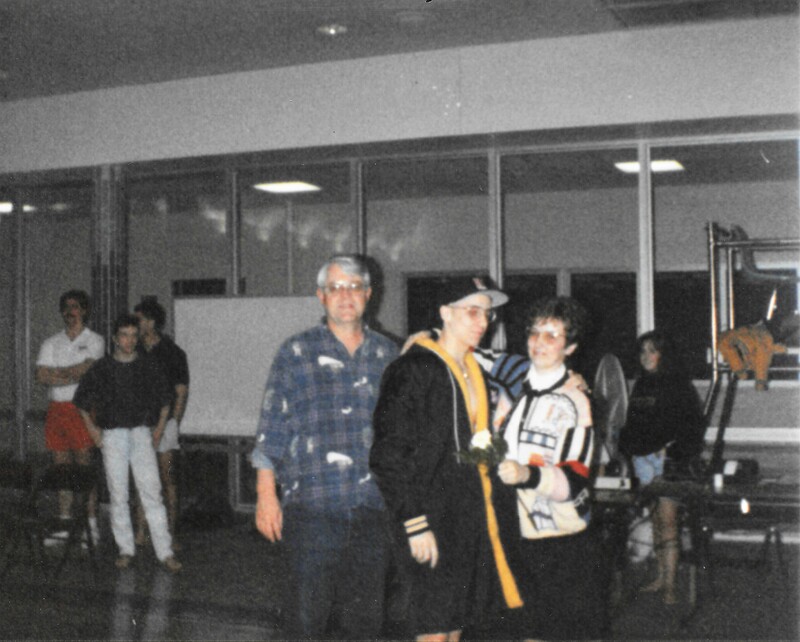 In fact, Adam eventually did finish in the top 10 in the state in the 100 yard butterfly, and went on to swim at Indiana University, both well after I had moved on. When I graduated, Adam’s parents gave me the most thoughtful gift, one I keep on my desk to this day. It is an ounce of silver with all three of my individual varsity school records and times engraved into it. It’s a great memento, and something that nobody else thought to do! I hope my divided attention didn’t leave me neglectful of the other freshmen on the team. In particular, I remember Dan Jarrett and Sam Hale as two with potential for contribution. I’ve recently reconnected with Kevin McKelvey, who I was forced to admit I didn’t remember well until I looked in an old yearbook. I guess that’s the way it is with seniors and freshmen, though. I was never especially close to the seniors when I was a freshman. The age/maturity gap between those grades is fairly wide, and since I had only lived in Lebanon for four years, I was at an even greater disadvantage than normal. I hadn’t had the opportunity to grow up with any of these kids. In addition to the new faces on the team, we had a pair of new managers. My sister Kristy and her good friend Christa Engle joined the squad and occupied their evenings with refilling water bottles, distributing kick boards, and keeping split sheets. They both saw fit to continue these obligations for the duration of high school. I had many special moments during my senior year, but having Kristy on the pool deck during some of my big wins is one of the highlights. I was happy that she wanted to share those moments with me. It meant a lot. As much talent as we lost to graduation when Chris, Mark, JP and Dan left, we still had a fairly solid squad going into 1992/3. We returned three state qualifiers: myself, Mike Ullom and Eric Forrester. I swam the 200 freestyle and butterfly events. Mikey was a good sprint freestyler, and Eric was coming on strong in the backstroke. Josh Deater was solid in every stroke and was expected to compete in the IM, and Matt Pullen was a breaststroker who’s contributions in the medley relay were vital. Matt Chambers was solid in the distance events and Matt Livengood was a utility swimmer who was making strides in the 200 free. I expected that before the end of the season, Adam Spray would make a splash in the IM or butterfly. One problem area we had was diving. Out state qualifier, Micah Peter, was ruled ineligible for his senior season due to age restrictions. He had been slow to progress through his early years of schooling due to his hearing disability, and thus exceeded the age allowed to compete under IHSAA rules. 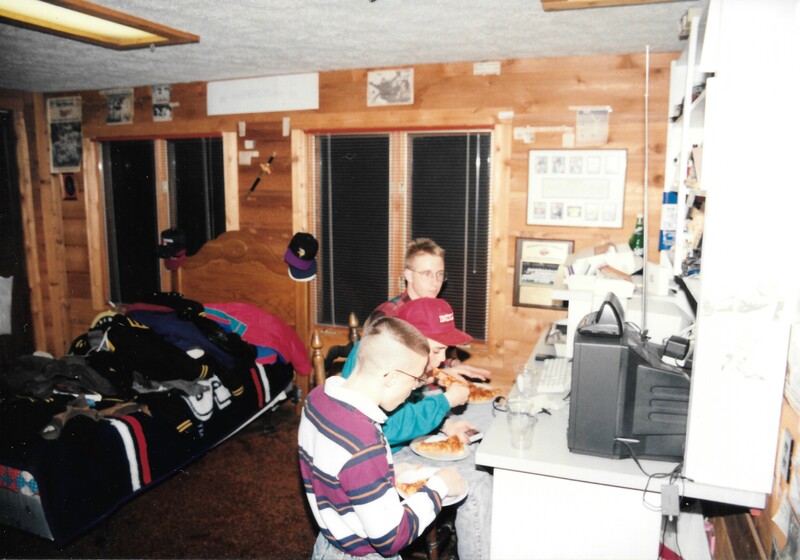 Coach Lohsl challenged the rule, but was not able to get it overturned in time for Micah to participate in 1992/3. Micah was able to return as an assistant/diving coach, but was not allowed to compete again for the Sharks. Luckily, we had an exchange student, Mike Than, step in for the year. Mike was nowhere near as natural and graceful as Micah, but he brought in some points where we otherwise would have lost out, and was quick to flash a smile to anyone on the team. He, along with returning divers George Roach and Aron Lamerson rounded out the squad. Pre-season training always included weight training as well as swim workouts. I don’t remember a single weight-training session from all my years of swimming, save one. Josh Deater, one of our breaststrokers, had a younger sister who swam on the girls team. In those days, the girls and boys swam at different times of the year, but Sara, a sophomore, had decided that she wanted to continue working out after the girls season had ended. So, she got permission from coach Lohsl to participate in the boys training regimen. I had known Sara, or known of her, for a couple of years. She was friends with my sister, and we were all a part of the summer swimming program together. But I didn’t know her well. What I did know, I liked. 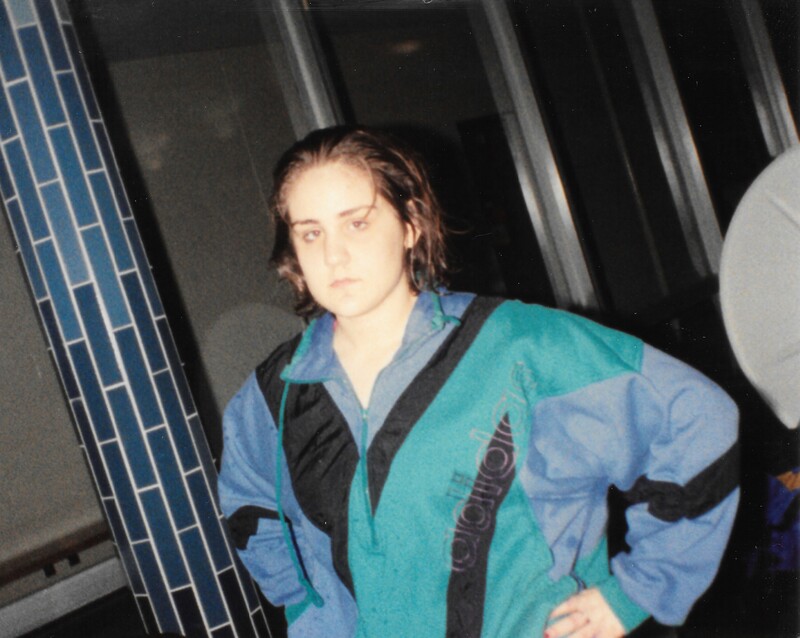 She was cute, athletic, smart, and she attended church, all things that were highly important to sixteen-year-old me. But when I saw her in the weight room and swimming pool, joking around and holding her own against other members of my team, I was thoroughly interested. One day, I spotted Sara across the weight room, preparing to do some lat pulldowns on a weight machine, and for whatever reason, I decided that this was the day to go talk to her. I swaggered across the room, probably wearing a tank top, knelt down slightly and struck up what was surely an awkward but short conversation. There was a lot of nervous smiling from both of us. She later told me that she was kind of embarrassed. I couldn’t tell. Her bright blue eyes crinkled a little when she politely laughed at my stupid jokes. I don’t remember exactly what I said or how I said it, but I walked away with a date to the upcoming basketball game. Even better, I’d just began a relationship with my future wife of eighteen years and mother of my four kids. I’m glad I decided to swagger across the room that day. The swimming season started out pretty much as we expected. We defeated Clinton Central easily, barely lost to West Lafayette (2 points). I thought the team dynamic was pretty good. We had a big group of freshmen who seemed to get along well together, and even occasionally with the upperclassmen. 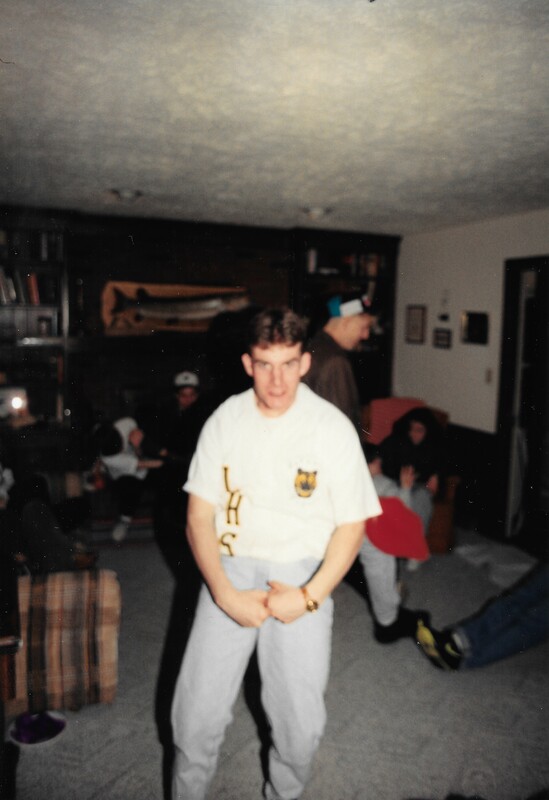 When one of them (probably Dan Jarrett) would get a little too goofy, we’d always threaten to have a freshmen initiation, without any intention of following through on it. As a captain, I wouldn’t allow that to happen. We were all one team, and there was no reason to foster an “us vs. them” attitude, unless it was done in jest. I liked having Eric as a co-captain. I think we were both respected for our past accomplishments, yet our leadership styles varied. Eric was more vocal, more “one of the guys”. I was more distant, a result of both the pressure of this being my final season and my age difference from the members of the freshman class. Our contrasting leadership styles seemed to work well together, and as such the season started smoothly. However, trouble was on the horizon. Not only was Eric more social on the swim team, he was more social in general. 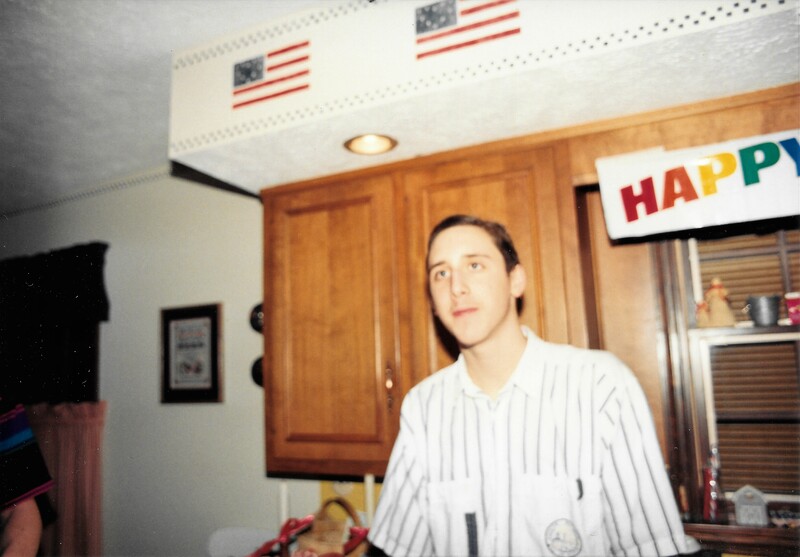 While I was mainly focused on swimming, Eric was involved in music, choir, and other social clubs and activities. At some point during the season, Eric had a conflict with one of our swim meets. Knowing that choosing another activity (I can’t remember if it was a trip, party or music show) over one of our swim meets would result in an unexcused absence, Eric instead decided to make up a story (family trip or something similar) as to why he could not attend the meet. He told his story to coach Lohsl and was granted an excused absence. Of course, the truth was eventually discovered. Lebanon is a small town, after all. An immediate ripple went out through the team as the rumor was passed from swimmer to swimmer. I’m sure Lohsl, being a man of principle, was upset about being lied to. Coach never consulted me directly that I remember, but he soon called a team meeting (minus Eric), where we voted on whether Eric should continue as team captain. I voted yes. I thought that Eric was a good captain who had simply made a poor decision, and that he deserved another chance. Somewhat selfishly, I was also aware that his ouster would mean that the duties of team leadership would fall squarely on my shoulders. I needed Eric. No Tiger Sharks team that I had been a part of had only one captain, and I wasn’t ready to be the first. I even tried to talk one member of the team into voting to keep him. That response surprised me a little bit. Where I was willing to give Eric the benefit of the doubt due to our three years of history together, others saw his act as a betrayal. As I’ve mentioned in previous blogs, we were a tight team, like troops in the trenches. While usually a good thing, it also enhanced the ill feelings when one of the troops decides not to show up for battle. Especially if that troop is your leader. Eric had lost the trust of the team, and they voted him out, leaving me as the sole captain of the 1993 Sharks. The pressure that I already felt intensified. Somewhere near the beginning of the season, a strange thing started happening. I began receiving recruiting letters, first though the school, and then directly to my house as the recruitment process got underway. I recently ran across many of these letters, some with questionnaires and applications still in the envelope. Being recruited by colleges is simultaneously exciting and terrifying. Having college swim coaches telling me that I would be a welcome addition to their squad really validated my entire journey up to that point. But knowing the gravity of the decision that lie ahead did nothing to calm the cyclone of activity that accompanied my senior campaign. Wabash College was one of the earliest and most relentless. Wabash is located in Crawfordsville, a mere 20 miles west of Lebanon, and the swim coach there was familiar with our conference. I have no doubt that she had even scouted me at some of my meets. Other local schools showing interest were the University of Evansville and University of Indianapolis. There were some surprises, too. These included the University of Missouri-Rolla (now Missouri University of Science and Technology) and Kalamazoo College. At some point, dad got excited about helping me with the college search, and he made a VHS compilation of my best swims from the previous year. Since moving to Indiana, I’d toyed with the idea of going back north for my college education, so we sent the compilation videos to swim coaches from some smaller schools in Wisconsin and Minnesota. Though I was still considering any size school, mom and dad were convinced that I would thrive in a smaller environment. Thinking back to my first semester at Purdue and some of the struggles I experienced trying to adjust, they were probably right about that. 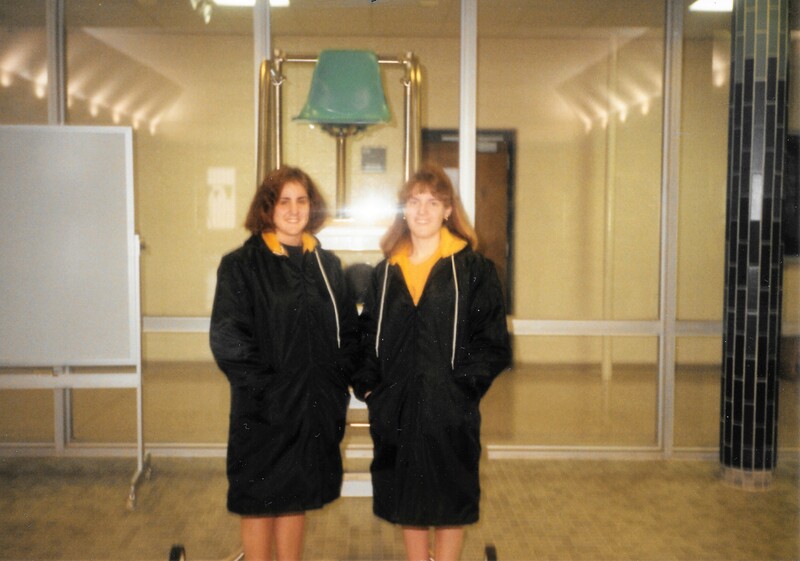 So, we sent the VHS tapes, and eventually took visits to St Cloud State University, Mankato State University (now Minnesota State, Mankato), and Carthage College in Kenosha, Wisconsin. Carthage showed immediate interest, but there were several things I didn’t like about my visit. First of all, the swim team was only a couple of years old, so they were still trying to get some traction. Also, it was completely frigid during my Christmas break visit there (Kenosha is right on Lake Michigan), but most importantly, I didn’t gel with the coach. Mankato State also showed a large amount of interest, but after my wintertime visits to all three campuses, I just wasn’t convinced that I wanted to move north. Probably the most prestigious college to actively recruit me was Johns Hopkins University in Baltimore, MD. Johns Hopkins recruited me harder than anybody except Wabash. I’ve still got no less then five pieces of correspondence from JHU athletic and admissions offices tucked away in a little folder. They even went as far as to have a member of the team send me a postcard while they were training down in Florida. JHU has a great swimming program, and a fantastic academic reputation. I’ll admit, I was flattered that they pursued me so hard, and gave them more than a sideways glance. The biggest drawback to JHU was that they were located over nine hours away from home, and I wasn’t ready to be so far away from family and friends. I’ll admit, this fear also played into my evaluation of the Minnesota schools, although at least in Minnesota I would have known a few people from previously living in that state. Remember, this was before Facebook, Skype, and even texting. Nine hours might as well have been half a world away. As the visits concluded, I eventually whittled down my list of potential schools to two, both different in style and substance. Purdue was always a favorite of mine for it’s academic reputation, proximity to home, and familiar faces. I had spent a few Saturdays on campus growing up, and had always enjoyed myself. I could picture myself going to class or sitting out by the engineering fountain. But if I chose Purdue, swimming was likely out of the question. I had received no interest from Division I schools, and Purdue was no different. On the other side of the coin, I was interested in a little liberal arts school up by Chicago called Lake Forest College. Lake Forest is a beautiful little school with a charismatic swim coach named Skip Cook. When I took my visit to Lake Forest, I was able to spend time with the swim team, and even have lunch with them. They seemed like a fun group, and I could picture myself fitting in there. One letter included a list of their top times for the latest season, and comparing that list with my best times proved that I would have had an immediate impact. In fact, I would have entered the program as the number one 200 freestyler. After visiting the school and hitting it off with coach Cook, I was ready to commit. I had several phone conversations with him, and even applied (and was accepted) for admissions. Lake Forest was the only other school I applied at besides Purdue. The only part about Lake Forest that I was unsure of was that they didn’t have a technology program, which was the degree that I was interested in pursuing. So it came down to Purdue, a huge school with a great computer science/technology degree track, and Lake Forest, the college/athletic experience I was looking for but no technical areas of study. I had always promised myself that I wouldn’t compromise academics for athletics, but still, I was on the fence. I might have even ended up a “Forester” had it not been for some sticky financial details. It turned out that we didn’t qualify for as much financial help as my parents were hoping for. In the end, I had to tell coach Cook that I had decided to attend Purdue. Of course, he sounded disappointed, and in a way, I was, too. According to the Lake Forest web site, coach Cook’s least season with the school was 1992-93 – the year he was recruiting me. As it turns out, he would not have been my coach even if I’d decided to commit to the program. There are times when I wonder how things would be different if I would have chosen to swim at a small school instead of going to Purdue. I don’t regret my decision, but my curious introspection gets the better of me during those times. My life today could have turned out much differently! 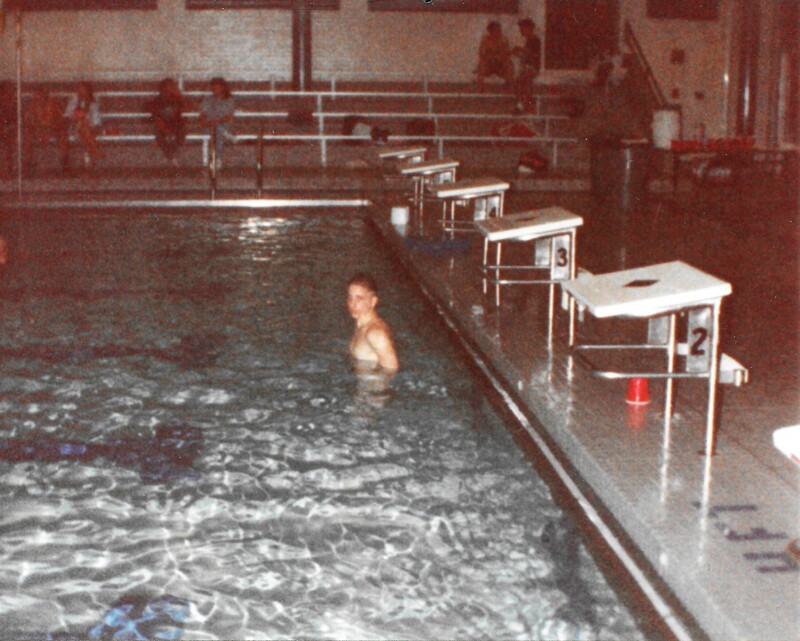 Even after making the decision to attend Purdue, I didn’t completely give up on the idea of swimming after high school. At senior night, when they announced our future intentions my pal Jim Roach clearly states into the PA system “…plans to participate in swimming and major in computer science…”. I had somehow convinced myself that maybe I had a chance at division I, even though I had no plan in place to work towards that goal. I just wasn’t ready to hang up the Speedo quite yet. Our dual meet season started pretty much as expected. We defeated Clinton Central and Crawfordsville fairly easily, while Lafayette Jefferson (I won the only first place against these guys! ), West Lafayette and Brownsburg beat us. As an indication of our youth, in each of these meets we were turning in 20-30 lifetime best performances even through the losses. We won several more meets vs. Frankfort, Brebeuf, Southmont, Lawrence Central and Speedway, while dropping the dreaded meter-pool meet against Avon. 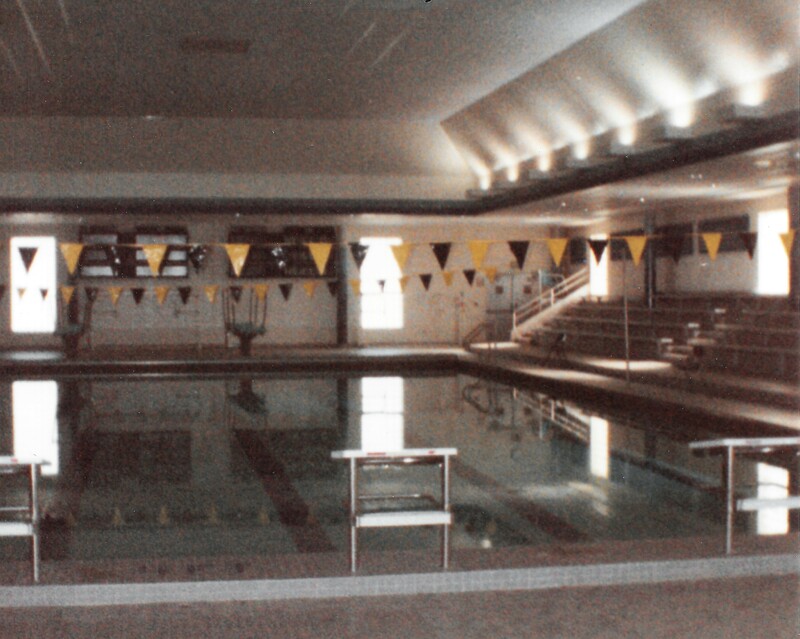 Avon had the only meter pool of anybody we swam against, and it was always a struggle, because meters are longer than yards, and we were used to practicing in a 25 yard pool. 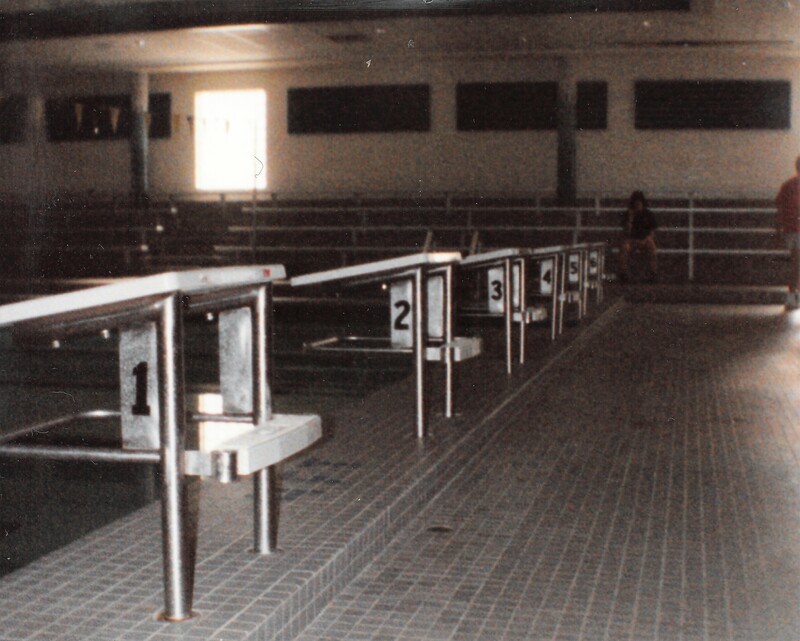 I remember swimming the 100 butterfly against Avon and thinking that I would never reach the wall at the end! At our Lebanon Invitational, our “warm-up” to the conference meet, we swam our normal events and defeated the next closest team by 160 points. Even with our youth, we had posted a decent 6-4 dual meet record prior to the Sagamore meet. As I’ve mentioned in all of my previous posts, the Sagamore Conference meet was an important meet for us. It was one of only two meets (the other being the all-important sectional meet) where we tapered our workouts in preparation for it. Not all of the other teams did this. In fact, I know Western Boone “swam through” the conference meet, because they were training for the sectional and state competitions at the end of the season. But we had never won the conference, and it was important to us to give it our best shot. It was a morale booster for the team, and a good practice run for sectionals a few weeks down the road. This year, conference was tough for me. I felt like I had given it everything the year before, and with our best team ever (historically speaking) we had still come up three points short of winning the meet. The conference winners, Western Boone, returned nearly everybody from the previous season, while we had lost four of our strongest seniors from the year before – five, if you include Micah’s ineligibility. I would do my best, of course, but right off the bat I knew it would be nearly impossible for me to repeat my four wins from the year before. I knew that Webo’s sheer number of seniors in my class would make it impossible for us to score well enough to win the meet. We simply didn’t have enough top-tier veteran swimmers to compete with them. Still, I was the returning conference champion in the 200 freestyle, and it was my title to defend. I had won the race in dramatic fashion over Webo’s senior Toby Linton the year before, and with Toby graduated, it would seem that my path to repeat was clear. However, I hadn’t counted on Webo reloading their top 200 spot with the tall, talented. focused Brian Euler. I was familiar with Brian, but he had bounced around to several different events (backstroke, butterfly) our junior year and I didn’t expect him to step into the 200 free and make a splash, so to speak. By the time he was a senior, Brian looked like a college swimmer. He was about 6’3” tall and 190 pounds. That put him about seven inches taller than me and about thirty pounds more muscular. He walked up to the block as if in slow motion, with that Oooh Yeah song from Ferris Bueller’s Day Off playing in the background. As I awaited the final heat of the 200, I had taken my normal one-legged stance at the starting block, awaiting my turn to mount and then explode off it. Brian’s prelim time may have been better than mine, but if he was going to take the 200 freestyle, he’d have to do it against me, personally. Two years after my graduation from Lebanon, I found myself dutifully heading towards one of the many computer labs required of my major. As was my habit, I grabbed a copy of the Purdue student newspaper, The Exponent, on my way to class. At that time, they used to deposit stacks of the paper in strategic locations throughout campus. When I sat down to log into a workstation, I glanced over at the paper that I had placed on the desk next to my keyboard. The front page story grabbed me – Two Ball State Students Shot. As I read further, my heart dropped. 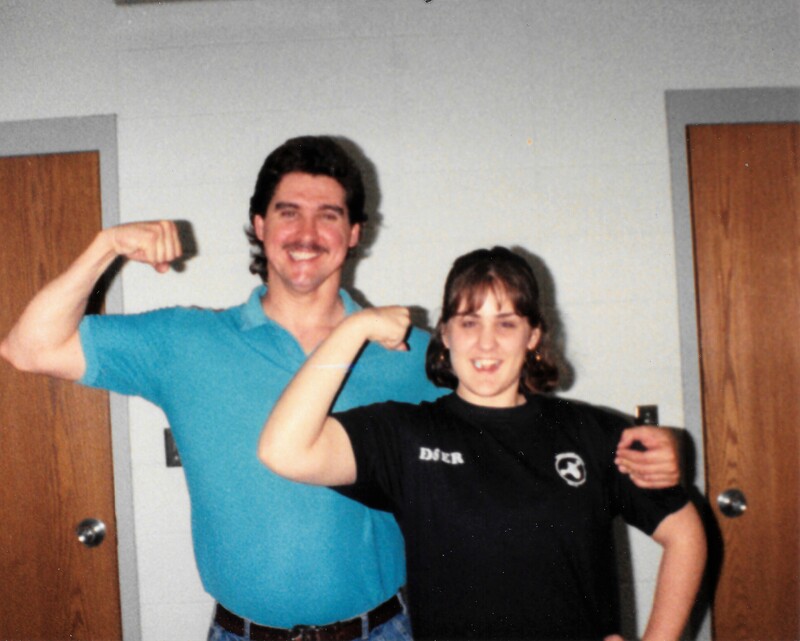 One of the students who had been shot was Brian Euler, my old adversary. Brian had been staying with a high school friend for the weekend who had been receiving harassing messages from an ex-boyfriend. The ex had broken into her apartment, shot and killed her, and shot Brian in the neck, paralyzing him. The attacker later shot and killed himself as police closed in on him. I couldn’t believe it. Brian was so strong. He was so fast. He was seemingly invincible. As I was coming to grips with the reality of the situation, I heard a couple of students from across the lab making light of the news. “One less Ball State student…” one of the quipped. I felt sick to my stomach. I couldn’t concentrate for the rest of the day. I wish I could report that everything turned out fine for Brian, but the honest truth is that I don’t know what happened to him after that. I’m sure he encountered numerous difficulties as a result of this tragedy. The only thing I can say for sure is how the news affected me, which comparatively is surely trivial. I lost a lot of my own sense of invincibility that day. After all, if a specimen like Brian Euler is vulnerable, what does that say about the rest of us? While writing this post, I learned that Brian Euler died only a few weeks ago. I hadn’t spoken to him since the last time we swam against one another in 1993. But for one year, our rivalry tied us together. Lebanon vs. Webo. Griggs vs Euler. The 200 freestyle. For the love of the race. Since I learned of Brian’s passing, I’ve wondered if I should have tried to reach out to him again. But I was never sure if he really wanted to be found, especially by old acquaintances who had little more than high school swimming memories to share. He appeared to have little to no Internet presence, which gave the impression of wanting to be left alone. People who I talked to who used to know Brian confirmed they also hadn’t spoken to him in years, since before the shooting. Even so, it would have been nice to talk to him at least one more time. Now that chance has passed. As the starting buzzer sounded for the 200 freestyle finals, we destroyed the water. Nearly the entire field was even at the first turn. We flipped again at the 50 mark. I lost some ground on Brian’s long, lean glide, and then caught up a little, and then lost it again on the turn. Still, I was not in panic mode. I was behind Toby for nearly the entire race the year before until the final 25 yards. We flipped again, and again. Finally, we were coming into the final stretch. It was time for me to kick it into high gear for the big finish. But this was a new year, and Brian swam a different race than Toby. As we both sprinted the last 25, he continued to pull away from me. I was at his waist, then his knees, and finally I knew that I wasn’t going to catch him. I finished with a decent 1:50, but it was only good for 2nd place. Of course I was disappointed to not finish my senior year with a win in my best event, but Brian was a gracious winner – I daresay more gracious than I’d been in previous years. We clasped hands and congratulated each other between gasps of air. That race was a microcosm of my senior year. I felt like I poured everything into it to come up just short. 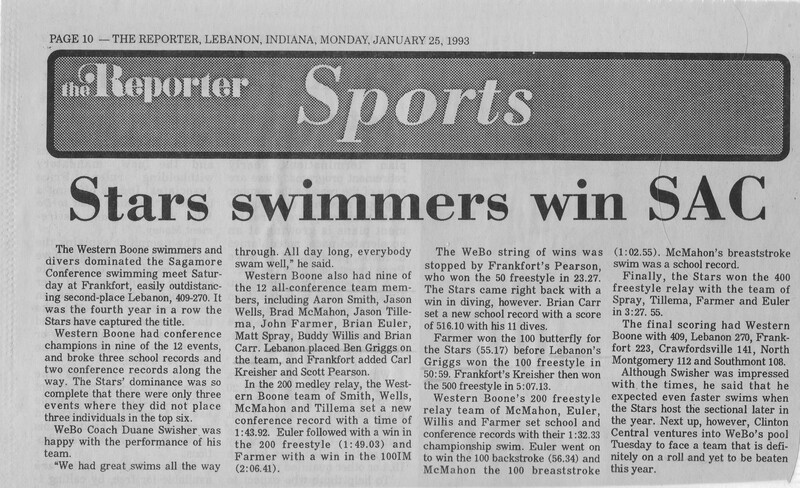 My favorite memory from the 1993 Sagamore Conference meet is the 100 Freestyle. We knew we weren’t going to win a lot of races, so we decided to “stack” the 100 freestyle with three of our fastest swimmers: Me, Mikey Ullom and Eric Forrester, our returning state qualifiers. The idea was to see if we could sweep the event. If we weren’t going to win the meet, we would at least make a statement! I suspect this was another motivational tactic by coach Lohsl, or perhaps he just wanted us to have some fun. Preliminaries had gone exactly as planned, and the finals heat saw all three of us lined up in the middle lanes: Mikey in lane 2, me in 3, and Eric in lane 4. Even though we were seeded in the first three slots, this race was no sure thing. The 100 freestyle is a sprint, and any slip-up in the start or one of the turns could easily knock a swimmer down one to several places. 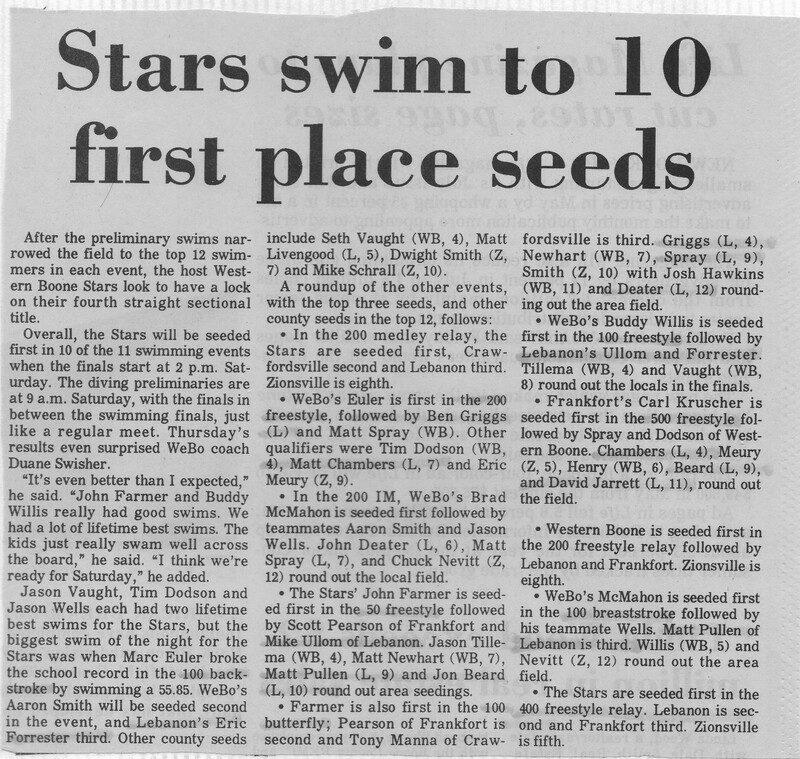 The rest of the field was made up of swimmers from Webo: Jason Tillema, Buddy Willis and Tim Dodson. Considering Webo were the heavy favorites to win most events, and even the conference meet as a whole, this race was important to us. When the buzzer sounded, we shot off the blocks like cannonballs, and splashed down simultaneously. Mikey, to my right, quickly sliced into the lead. I was about at his shoulders on the first flip, but I wasn’t concerned yet. I was feeling good on my carbohydrate load, and had plenty of energy left. I couldn’t see Eric in lane four, which I assumed meant that he was behind me. I caught up with Mikey by the halfway point, and started to pour it on. I felt Mikey start to slow down, but being a 200 swimmer, I was able to keep my pace steady, and even speed up a bit after the final flip. By the time we hit the halfway mark on the final length of the race, I had started to pull away from the field. I hit the wall in first, and looked up just as Mikey touched for second. Then I turned around to look at Eric, but he had already finished, not quite one second ahead of Western Boone’s Tillema. The Lebanon swimmers who were cheering us by the blocks, those who were watching from the poolside and the parents in the stands above all let out shouts of triumph! Mikey, Eric and I had swept an event at conference. We’d never seen an event get swept at this level, let alone been part of it. As I floated back over to Mikey to offer congratulations, the gravity of the moment hit me. I would collect my sixth, and as it would turn out, final all-conference plaque, and I had done so flanked by two of my remaining best friends on the team. I had so many fond memories of the Sagamore Conference meet, from breaking the freshman 500 freestyle record all the way up to this race, and now it was nearly over. It was my last individual Sagamore event, and I’d won it. I looped my left arm over Mikey’s tall, thin frame in sort of an awkward side-hug. Then I turned around to Eric in lane four and hugged him, as well. I’m not really much of a hugger, even on dry land (and fully clothed), but this was a situation that called for emotion. I was so thankful to those two guys for being with me in that event, and for giving it everything they had to make it a special memory for all of us. After sweeping the 100 freestyle, one would think that a victory in the 400 freestyle relay would have been a forgone conclusion. In fact, we were seeded first after prelims, but only by 0.15 seconds. Our relay consisted of Mikey, Matt Chambers, Eric and myself. Despite the slim margin, we felt we had a good chance to repeat as conference champions in this event. But by the third leg, Webo was nearly 3 body lengths in front of us. At the anchor position, I still believed I could catch us up, and maybe even beat them at the wall, but halfway through my leg of the relay, it became apparent that the gap was too large for me to make up against Brian Euler. We were too far behind, and Brian was too fast. We’d have to settle for second-team all-conference, even though we bettered our seed time by nearly a second. My last Sagamore Conference swim meet had come to a close. The relay loss punctuated the sting of knowing that not only had Lebanon still never won a conference meet, but we’d also been destroyed by our crosstown rivals 409-270. Western Boone, with their huge senior class, had won nine of twelve of the events. My 100 freestyle victory was the only win for Lebanon. As we exited the locker room, some of the junior class members were declaring “next year” to be our year, since Western Boone would graduate a bulk of their strength and we would return so many. But for me, there would be no next year. This was my last shot at being a part of a conference title, and though I poured everything I had into that meet over the past four years, that championship had continued to elude me. In reviewing my race videos from 1993, one thing that jumps out at me is my change in demeanor from the previous year. Perhaps it was the lack of major wins, but the jubilant celebrations were replaced by a more subdued, controlled version of myself. I’d like to think that I matured over that year. Maybe the responsibility of team leadership was at the forefront of my mind, or I’d subscribed to the “act like you’ve been there before” school of thought. Whatever the case, I’m glad that the once boisterous junior had been replaced by a senior who would, more often than not, calmly turn to an opponent with a word of congratulations and a handshake after a close race. After the conference meet, we shifted our focus rapidly. By the time conference is complete, you understand a lot about your team: who your leaders are, who performs at the big meets, who excels in relays, and where to slot everybody in order to maximize points. But since we didn’t have a stellar dual-meet record (6-4) to protect, or a conference championship to prepare for, we pivoted to trying to figure out how many swimmers we could get to qualify for state. We’d come a long way in four years. 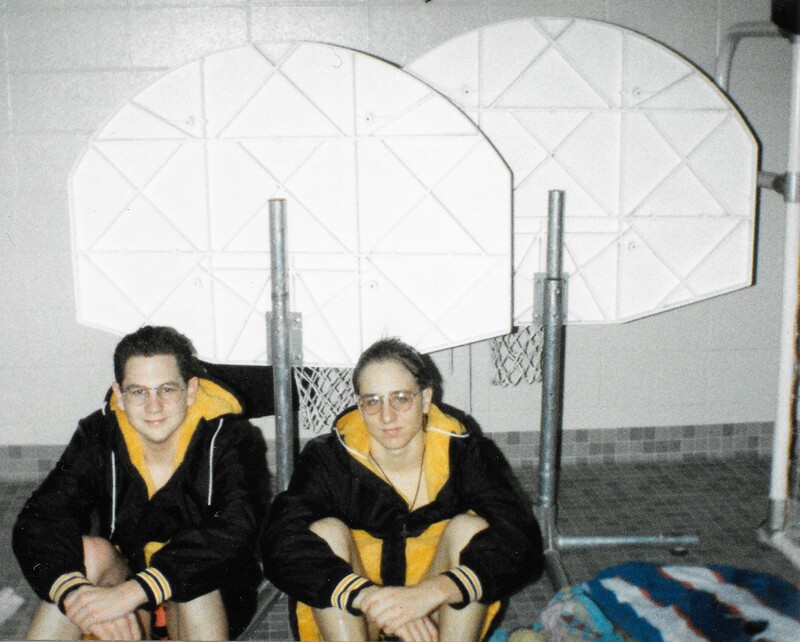 My freshman year, the focus was on getting someone qualified for state, now the only question in our minds was “how many?” At conference, we had loaded our best swimmers into the two freestyle relays, and lost both to Webo by a fairly decent margin. Since our only hope for sending a relay to state was to beat Webo, we decided to instead focus on the medley relay, a race where each of the four swimmers performs a different stroke. We had placed our best swimmers in the medley a few times earlier in the season, but it was a difficult thing for us to do because of the order of events. The medley relay was right before the 200 freestyle, my best individual event. If I swam in the medley, it was extremely difficult to hop out of the pool and then immediately swim the 200. 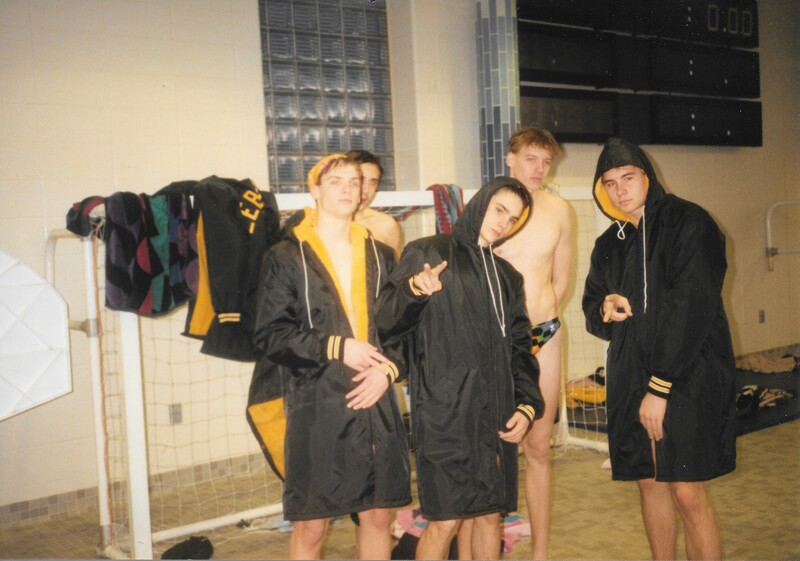 When we stacked the relay earlier in the season, I usually swam a different individual event like the 100 freestyle. But leading up to state, I needed to continue swimming the 200 in order to keep the “race feel” alive. Swimming the 200 at sectional after not participating in it for months could have wreaked havoc on my ability to pace the event. Coach Lohsl asked me what I wanted to do. 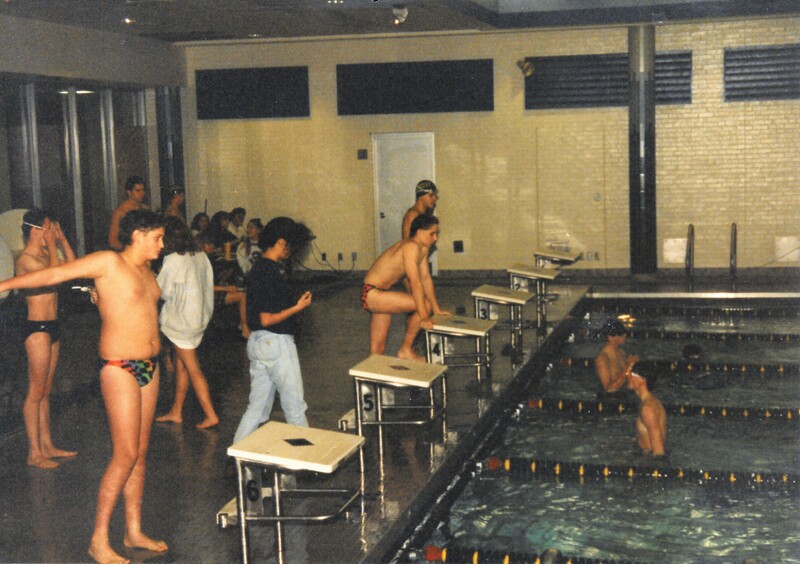 I was our fastest butterfly swimmer, so leaving me out of the medley would cost the relay a few seconds – which would likely exclude the rest of the relay team from qualifying for the state meet. I decided I could do it. I told him to put me in both the butterfly leg of the medley relay and the 200 freestyle for the rest of the season. I wanted another relay to qualify for state, just as we’d done twice the year before. Plus, I reasoned, I didn’t have to be at my absolute best for the 200 freestyle in most of our remaining dual meets. I already held the school record in the event, so that wasn’t a consideration, and even in a fatigued state I could still swim the event in the 1:52-1:54 range, which was fast enough to win against many of our remaining opponents. So, scoring points in dual meets wasn’t going to be a problem, either. When we got to sectionals and state (if we made it that far), events were organized into several heats, so I would get more rest between the relay and my main event. Lastly, as a captain, I wanted to show my teammates that we should be doing everything we could possibly do for the good of the team, even if it seemed completely crazy. 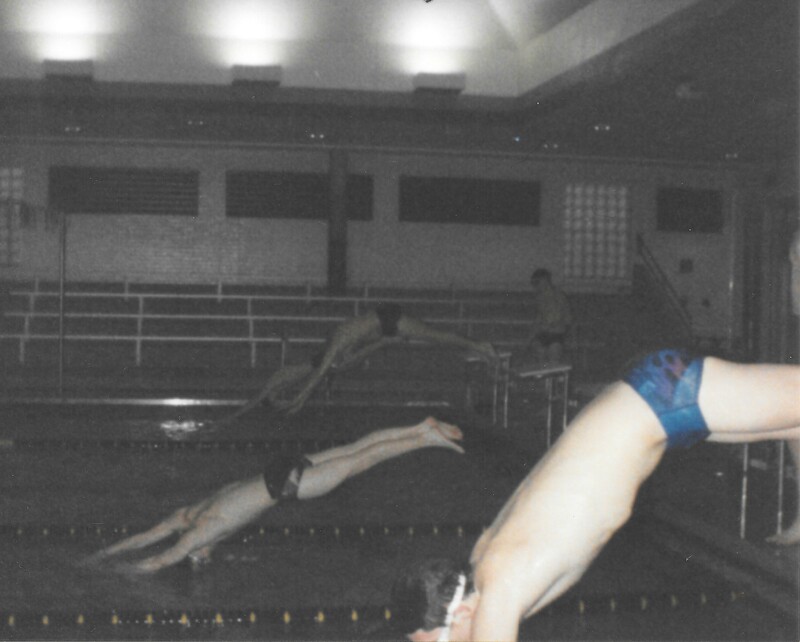 So I spent the last half of 1993 crazily swimming the butterfly leg of the medley relay, dragging myself out of the pool while the freestyle leg (usually Mikey) finished up, and then hopping back up on the block to try to win the 200 freestyle. Interestingly, with the exception of the Webo meet, which we knew we wouldn’t win, things really started to fall into place after conference. Even while focusing on fine-tuning our sectional lineup, our dual-meet record started to improve. We beat both Speedway and Lawrence Central easily, lost to Webo, and then cruised to wins over North Montgomery and Decatur Central before barely nipping Danville. We finished off the season with large victories over Zionsville and Westville. Aside from team goals, I also had my eye on a personal objective. I currently held three varsity records (200 freestyle, the 200 freestyle relay and the 400 freestyle relay) but there was one more that I felt would be attainable by the end of my career: the 100 butterfly. I had always been amazed by the butterfly stroke. When performed correctly, it looks like something that shouldn’t be humanly possible. When performed incorrectly, it feels like something that isn’t humanly possible! When I first started swimming, I never considered myself anything but a freestyler. However, over time, as my freestyle improved, so did my butterfly. When I was in shape to swim the fly, it sometimes felt as if I was skimming along above the water instead of trying to power through it. 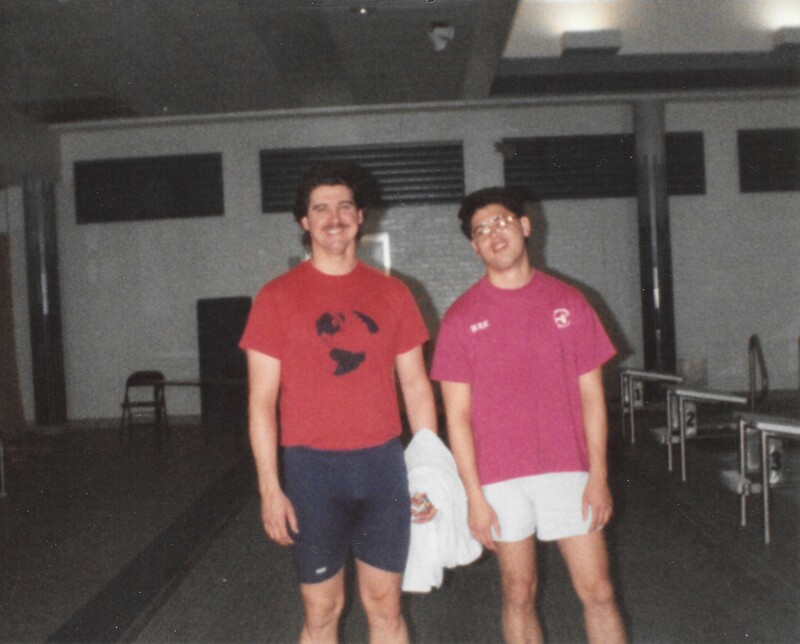 As a junior, I had come out of nowhere to win the 100 butterfly at conference, and my 1-2 finishes with Mark Ullom in 1992 were some of the most fun and exciting races I had swum. 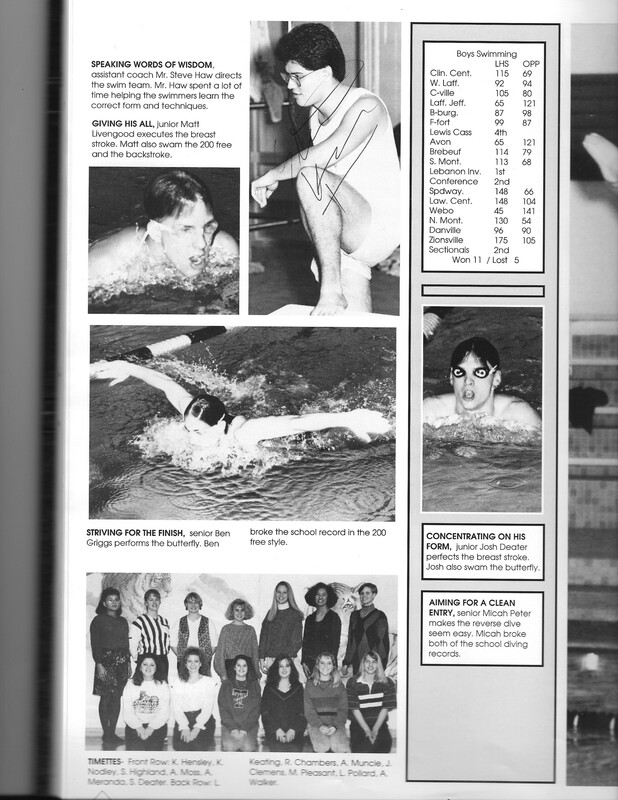 So, while I had morphed somewhat into a sprint freestyler by my senior year, I had a real soft spot for the 100 butterfly, and by 1993 I was only a couple of seconds from the Lebanon record. After my conference win in the 100 freestyle, I switched over to butterfly for the rest of the season to try and set a new high mark in that event. I came close a couple of times. I was no longer happy to break 1:00 in the event (or by beating my best friend Mark Ullom). I was now consistantly swimming 0:57’s and 0:56’s, coming oh so close to that elusive 0:56.10 swam by Alan Hutchinson way back in 1980. By this point in my senior season, dad was videotaping most of my events, and if you watch both the Speedway/Lawrence Central and the Western Boone meets, I patiently wait for my butterfly time to be announced before slumping my shoulders and giving a slight head shake, knowing that my best on that day was not quite good enough. Time was running out. only four dual meets remained, plus sectionals, and unless I qualified for the state meet in Indianapolis, my time to break the butterfly record would be over. The North Montgomery Chargers were a weaker than average conference opponent. We had already beaten them handily at the Sagamore meet, so we took the opportunity to “swim off” against them and shake up our lineup a little bit. 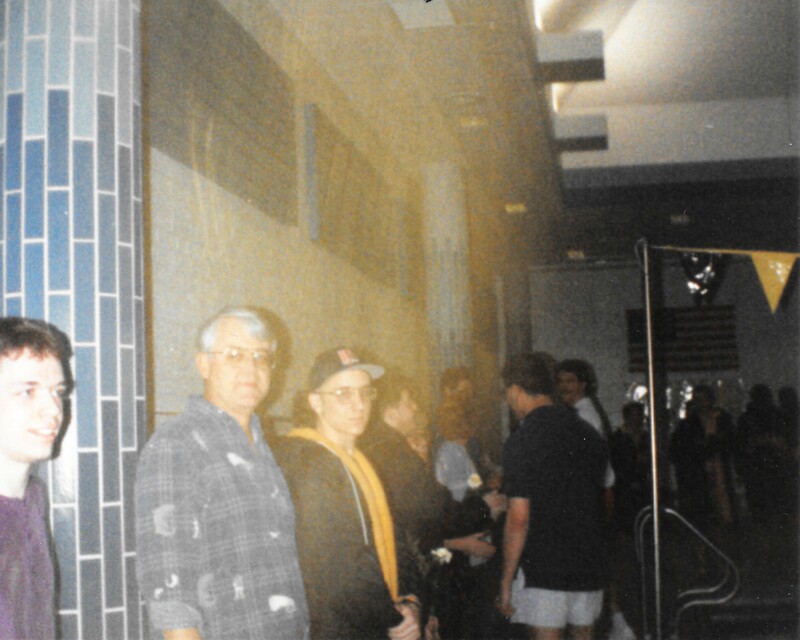 Coach Lohsl decided to give me a break from the 100 butterfly pursuit, instead putting me in the 500 freestyle, the event that altered my swimming career trajectory back in 9th grade when I broke the freshman record. It had been exactly one year since I swam the 500. I had won it the previous year against Northmont, so I guess it had become kind of a tradition for me to swim it against them. I expected to win the event, so I wasn’t even nervous about it. This late in the season, I was in good enough shape to swim both sprint and distance freestyle events. The only thing I was a little concerned about was the pacing of the race; I hadn’t swum it regularly since my sophomore year, and I was unsure if I still remembered how to hold some energy in reserve for the end of the race. I have forgotten more races than I remember 25 years down the line, but this one I can recall with some level of confidence. I remember taking it out at a decent pace. I was used to swimming the 200 freestyle, so I paced it just slightly slower than I would have that race. I remember cruising to the 200 mark, my normal stopping point. Than 300. Than 400. I had long since left all of the competition far behind, just as expected. Then I saw the orange boxes on the lane counter waving up and down at the end of the lane, indicating that I was on my last lap. I picked up the pace towards the end like I always tried to do on any race, and finished strong. To my surprise, as I pulled my head out of the water, several members of my team were standing by the starting block in my lane, alternating their glances between me and the time clock on the wall behind the pool. Some had their fists raised in victory, some just beamed. The crowd also seemed unusually raucous for a race that wasn’t even close at the finish. I was completely confused. Somebody yelled down at me: “You broke the record!” What? I turned around, but without my glasses I had to squint to see my time. It read 5:12:08, not even a second better than the best 500 time ever swam by a Tiger Shark (Scott Sanders had previously held the record with a 5:12.90). I couldn’t believe it. I had taken about 10 seconds off my previous best time. I was never more shocked after a race than than I was after this one. Later, the significance would sink in. The dreaded 500 freestyle. The race that my dad talked coach Lohsl into putting me in as a wee freshman. The race that suddenly thrust me to the attention of my teammates way back in 1990, and then betrayed me the following year as I plateaued despite hours of distance workouts, had been conquered, and by pure accident. I could finally put that race to rest, and I did. That was the last time I ever swam the 500 freestyle. Interesting side note: I also won the 50 freestyle that night. First place in both the shortest and longest events! The next meet was at Decatur Central. I went back to swimming the 100 butterfly and after long last, finally broke the record in that event. Strangely, though I remember trying pretty hard to break the record, I don’t remember this particular swim where I finally did it. I do remember pointing at Adam Spray as I was walking back to the deck and telling him “that one’s yours!”, an indication that I wanted him to be the one to break it in the years to follow. He shook his head vigorously as if to indicate that he wasn’t worthy of such a blessing, but deep down we both knew it to be true. 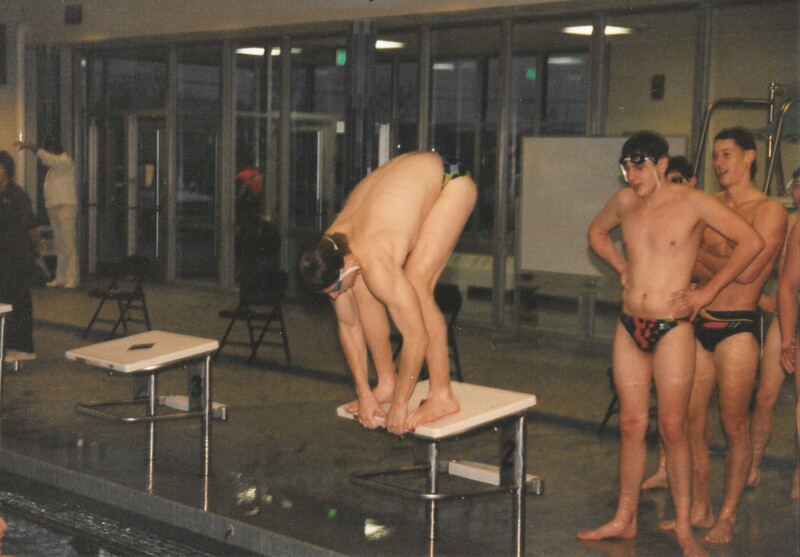 Adam was only a freshman, but was already a great butterfly swimmer. He was breaking a minute as a 9th grader, something I didn’t do until I was a junior. Sure enough, not only did Adam quickly better my mark, but he also finished in the top ten statewide before he graduated. So, I’d broken varsity records in back-to-back dual meets. Maybe I’d matured, or maybe I had just accomplished enough to this point that I was starting to feel fulfilled, but I wasn’t nearly as protective of my accomplishments as I had in the past. I had held a silent grudge against Eric Forrester for breaking my freshman 500 record throughout half of my sophomore year. But now, I really wanted Adam to break my record. In fact, if anyone was going to do it, I would rather it be a teammate and someone who I knew had worked hard for his success. My final meet in the Lebanon “natatorium” was one for the books, made even more interesting by our opponent. That evening, we were competing against Zionsville and Westfield. Zionsville was the 3rd Boone County school besides us and Western Boone, and they were usually close to our skill level. In recent years, Zionsville has become a state powerhouse, even challenging Carmel’s long reign at the annual Indianapolis championship. This past year (2017), Zionsville had a medley relay team that broke the national boys high school record. But in 1993, things were a little different. It was senior night, and the team was pumped. For three of us, Jon Beard, Aron Lamerson and myself, this would be our last meet in the home pool. I can’t speak for Jon or Aron, but I did my best to treat it just like any other meet. Still, it was easy to feel the extra energy in the air, and I knew that the guys were swimming for me. No disrespect to Jon and Aron, but I was the only four year senior on the squad, a team captain, and seemingly a popular leader by example. The team wanted to show their appreciation by sending me off in a big way. I loved them for it. We started things off by breaking the oldest record on the varsity board: the medley relay, last set way back in 1976. Eric Forrester, Matt Pullen, myself and Mike Ullom bested the previous time by over a full second. This relay team was to be our sectional squad, and we hoped our time at this meet would be a sign of things to come. I came right back and swam the 200 freestyle in the next event. Being tired from the relay, I didn’t swim my best time (by a long shot), but it was good enough for another first place. Two races, two wins. The meet continued like this. Race after race, Lebanon took first place. The 50 free. The 100 Free. The 100 butterfly. The 100 Breaststroke. Both freestyle relays. Diving. Diving! I’m not sure we had taken first place in diving since Micah was on the squad the previous year, but somehow Mike Than had pulled off a blue ribbon on this night. The only thing that slowed us down was the break we took in the middle of the meet to honor graduating seniors. It was a special ceremony for me, as I had only a few quick minutes to reflect on everything I’d accomplished in this pool, the uncountable number of yards I had practiced in it, the transformation of it during my Sophomore season, and most importantly, how much I’d changed in that time. I had gone from a quiet, mushy little Freshman who was more comfortable hiding in the corner and cheering on teammates than being in the spotlight to, not just a team leader, but the team leader. The one who was just expected to win every event. The one who was known for not losing his cool in any situation. Lohsl was the coach, but I was the one in the locker room who they looked up to, and I felt it during that ceremony. Surrounded by my sister Kristy, as a team manager, my parents, who were standing on deck with me, my best friend Jim Roach announcing my name over the PA system, the timettes, who cheering from the blocks, and my other family – my coaches and teammates – I was slightly overwhelmed by the moment. Do you know what I wasn’t thinking about? All of the people in Lebanon, and even the high school, who didn’t even know we had a swim team. I didn’t give one second’s worth of thought to those who didn’t know how good we were, or how hard we worked. Unlike in previous years, when I had carried a chip around on my shoulder, trying to prove myself to a largely indifferent school and community, this night was all about us. All of the thoughts that I had once used for motivation had faded long away. The only thing that mattered was the people cheering in that pool at that moment. These were my people. We coasted to an easy win in my final home meet. Now, whenever someone talks about the mighty Zionsville swim team, I can casually mention that I won all four of my events the last time I swam against them. In fact, Lebanon won 10 of 12 events that night. We finished the regular season on a roll, with a fairly impressive 13-5 dual meet record, only 2 wins short of our high mark from the previous year. Considering we lost 2 state qualifiers, I decided it was a successful senior campaign. I knew I would swim the 200 freestyle at the sectional meet. That wasn’t even up for discussion. The event that I had swum consistently for the last four years and for which I was best known gave me the best chance to advance to the state finals. But beyond that, I had some decisions to make. I had won the 100 freestyle at conference, and looked to be one of the fastest in our sectional as well. I had also been swimming the 50 freestyle occasionally, thus completing my transformation from distance swimmer to pure freestyle sprinter. 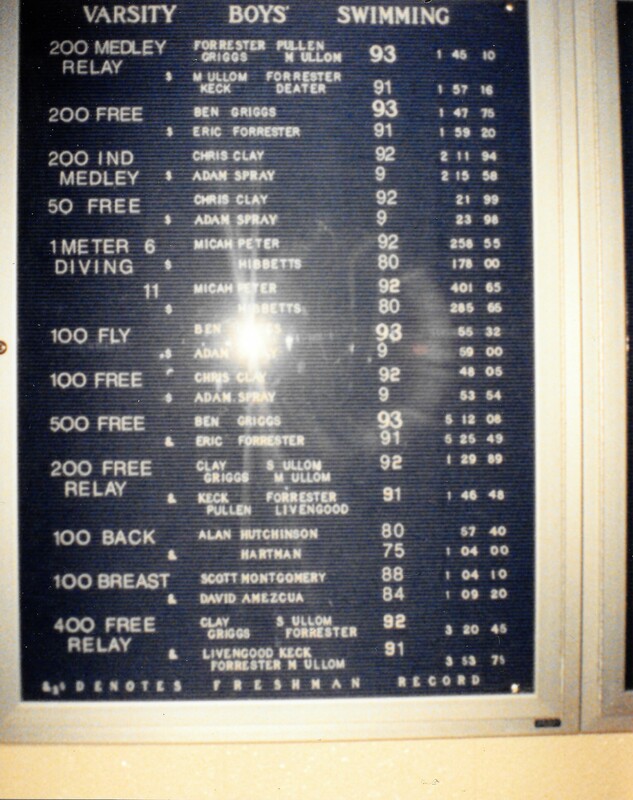 But I had also recently nipped the varsity record in the 100 butterfly. After talking it over with coach Lohsl, I settled on the 100 butterfly for my 2nd individual event. Coach and I both thought I had a chance to win the butterfly, and I was the only one on the team who was in that position. In the 50 and 100 freestyle events, Mike Ullom was expected to compete for the top spot. If I swam in the 100 free, I had a good chance to win and advance to state, but that would mean knocking Mikey out of the top spot in that event. Our goal was to qualify as many swimmers as possible. To do that, I would have to try to win the butterfly and hope that Mikey could do the same in his sprint freestyle events. In all transparency, I wasn’t being as chivalrous as it might seem. If I was going to qualify for state for the second year in a row, I didn’t want to do it by myself. I had already carried the large weight of leadership on my shoulders for a bulk of the season, I couldn’t bear the thought of lugging another burden down to the state swim meet all by myself as Lebanon’s lone representative. Questions swirled around our relay configurations. The previous year we had qualified both freestyle relay teams, but we’d lost 2 members from each of those teams to graduation. Western Boone, with four seniors in each freestyle relay, looked poised to win both. Our medley relay was fresh off setting the varsity record, and had (we thought) a legitimate shot at winning sectionals. But those odds depended greatly on which relays Webo decided to stack with senior talent. Would they continue to pursue the freestyle relays, as they had done at the conference meet? Or would they switch it up and load up the medley relay, trying to catch everybody else off guard? Thus began an infamous series of events that would shape the outcome of the 1993 state qualifiers and haunt the memories of those affected. 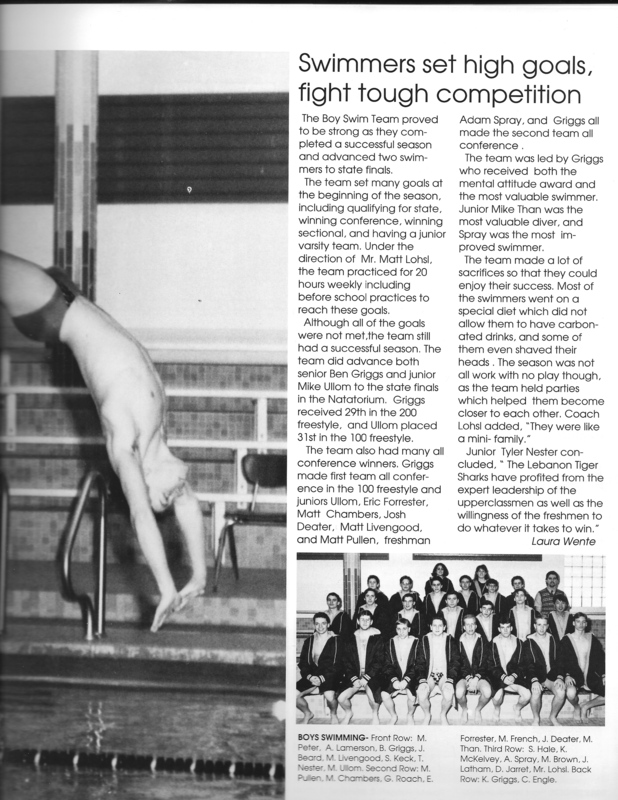 Coach Lohsl was in his fourth season as a head swim coach. He was named Sagamore Conference coach of the year in only his third season at the helm. He was fresh and innovative in both his motivation techniques and his meet lineups. For large meets like the sectional competition, we were allowed to enter eight swimmers to each relay: four swimmers and four alternates. Because we didn’t know which relays to focus on, he decided to see if we could get Western Boone to tip their hand to us. The plan was to enter all eight of our best swimmers into every relay. 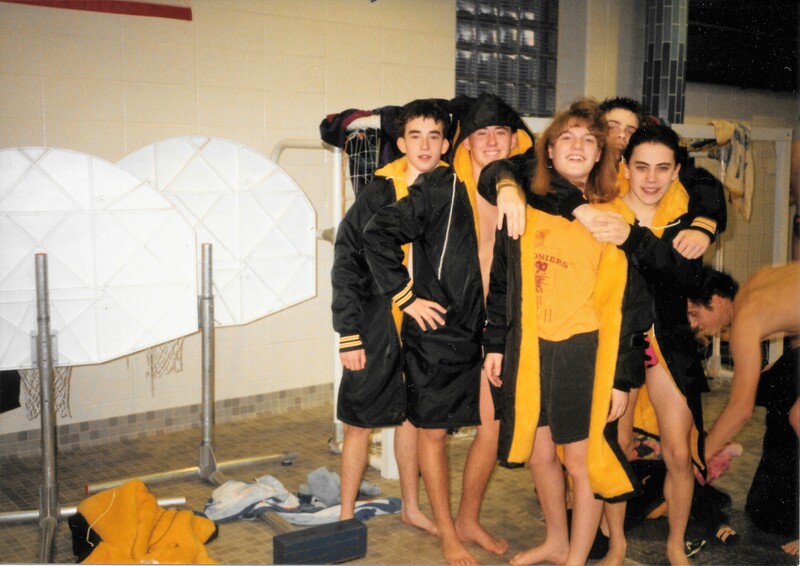 Then, at sectional preliminaries, we would swim the best four in the two freestyle relays. We had faith that even the “B” team could advance the medley relay into the top six and qualify to swim in the final heat. Then, in the finals, we would switch some of our best swimmers (who were listed as alternates for prelims) into the medley relay and surprise everyone with a potential win and/or state qualifying time. It was a brilliant and daring idea. The only problem: it wasn’t legal. As expected, all of our relays qualified to swim in the sectional finals heat on Saturday. However, when coach Lohsl tried to enter our best lineup into the medley relay, Western Boone coach Duane Swisher challenged it. Even 25 years later, I’m not sure I completely understand the minutiae surrounding when and how an alternate can be substituted into a relay, but whatever it is, what we were trying to do was not allowed per IHSAA rules. We were required to enter the same relay starters for the finals as we had for prelims. I can only remember being called into a closed-door coach’s meeting twice in my swimming career, and in neither case was good news delivered. The first time was when I was still swimming distance, and coach had learned of a freshman 500 freestyle phenom who was going to block our chance at a conference win in that event. 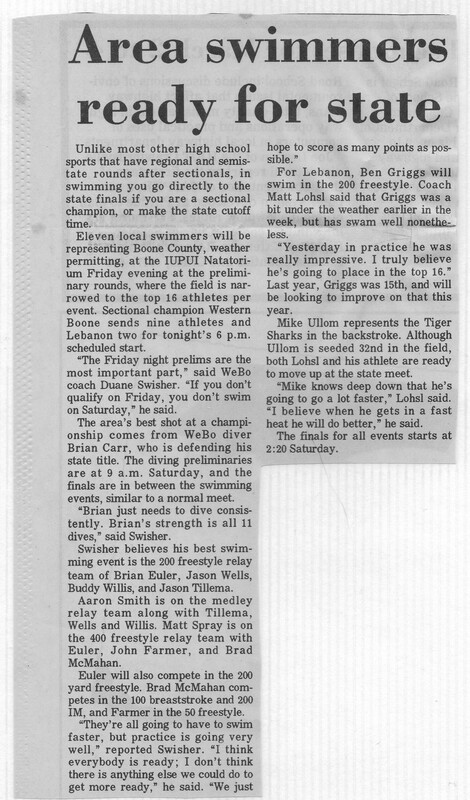 This time, he called all of the medley relay record holders in: myself, Mike Ullom, Eric Forrester and Matt Pullen. As coach explained the situation, we sat in stunned silence. Matt Pullen was the most affected. He hadn’t been on the state qualifying teams the previous year, and he wasn’t on either of the freestyle relays this year. The medley relay would be without my butterfly and Mikey’s freestyle. Making matters worse, our 2nd best butterfly swimmer (Adam Spray) was already in both freestyle relays, as well, meaning that he could not substitute for my butterfly leg in the medley. This left Matt on a medley relay without our best sprint freestyler and with a 3rd string butterflier. Two days ago, he thought he’d be competing for a chance (maybe his only chance) to advance to the state finals. Now, it was all gone. After the meeting, Matt stormed past the rest of us and out the door. He ignored our asinine questions: “hey, are you ok?” and our empty promises: “we’ll get ’em next time”. I felt terrible for him. Eric, Mike and I had already experienced the thrill of state. All three of us had high seeds going into the sectional finals, and were members of some fairly strong freestyle relays. Only Matt was left without a valid shot to advance. We had no right to try to comfort him. As much as Matt struggled with this setback, Coach Lohsl had an equal amount, if not more trouble, facing the reality of what we had lost. I could see it on his face during the meeting. I watched his tired, regret-filled eyes as they followed Matt Pullen bolting out of the coach’s office. Twenty four years later, I had the opportunity to sit down and reminisce with coach about this exact moment. I prefaced it by telling him that I wasn’t setting out to place blame, but I wanted to get the story right. His ability to recall the event before I’d even described it in detail was telling. As he shared his recollections, his voice softened and his eyes focused on the nothingness on the wall behind me. It was as if he were reliving it all over again. I think it was a low point, perhaps the lowest point, in his coaching career. The depths of it were magnified by it coming on the heels of the 1992 season, where we could do no wrong. I can’t think of a more disconcerting event in my swimming career. The next day, we would possibly be competing for the last time this season. For me, possibly the last time ever if I didn’t qualify for state. We were supposed to be at our best. We’d trained for four solid months for this day, and now this. Tumultuous as this revelation was, there was nothing we could do about it. We were locked into our events, so the only course of action was to move forward and swim our hardest. Western Boone was going to win, we knew that. Coach Lohsl was even quoted in the local paper as saying “They have too much depth this year (to be beaten)”, a rare concession on his part. But that didn’t mean we were going to roll over. 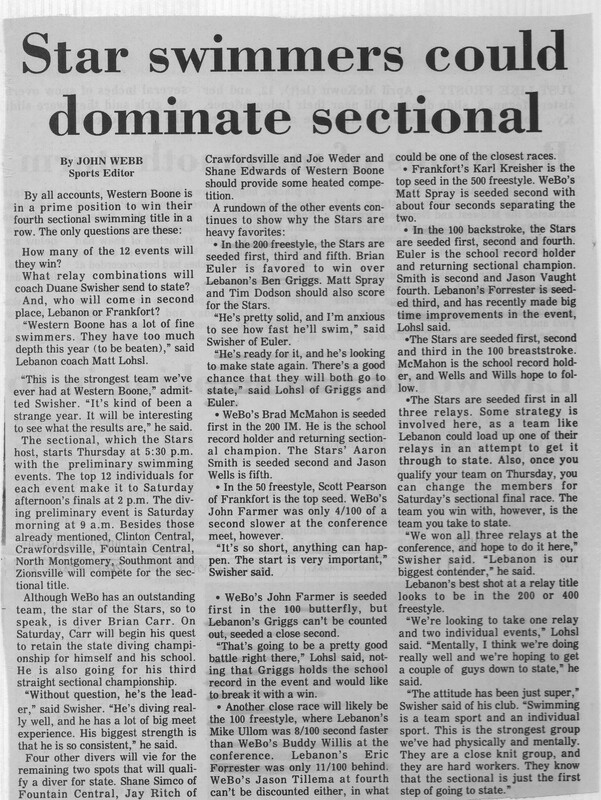 I had always enjoyed playing the role of spoiler, and we had ample opportunity to sneak up on them in a few events going into a meet that the same local article had pondered “how many of the 12 events will they (Webo) win?” The hidden context being, could Western Boone win them all? Despite being penalized out of contention, our medley relay team finished a strong 3rd behind Western Boone and Crawfordsville in a time nearly five seconds slower than our best. It wasn’t enough to win, and wasn’t even close to a state qualifying time. Possibly the only upside to not being able to put our best medley relay team together was that I no longer had to worry about swimming two events back-to-back. My 200 freestyle time had suffered towards the end of the season due to pulling this double-duty. Now, I could fully concentrate on my best event. Brian Euler had the number one time in prelims, but when I’d swum against him in our duel meet with Western Boone, he’d barely beaten me. I was confident that I could beat him this time, as long as I could stick with him until the end. As we stepped up to the blocks, I saw that Brian had shaved his whole head with the exception of a tiny strand of hair that hung down the back. If possible, the new haircut made him look even taller and more menacing that I’d remembered. But my focus was still on the task at hand. I only had to touch the wall first. The rest of the race didn’t matter. The starter was slow. We took our mark, then he had us stand up again. Then we took our mark again, and finally the buzzer sounded. I executed my plan perfectly for the first 175 yards. I stuck right with Brian, much as I had done with Toby Linton the previous year. Matt Spray from Webo was bearing down on both of us. On the final flip, I engaged my extra gear and powered towards the wall. In previous races, I had been able to wear down my competitor during the first 2/3rd’s of the race and beat them right at the end. This year, Brian was able to swim his race using a similar strategy. When I kicked in my extra gear, he kicked in two extra gears of his own. I saw him pulling away, but I couldn’t catch him. I dug deep, kicked hard and fought the water, but Brian Euler’s tall, lean body slowly inched further and further away from me. He won the event, securing a lane for himself at the state meet. I came in just over a second and a half behind him, which was still 2 seconds better than my previous Lebanon varsity record in the event. Even though I’d lost, I was ecstatic with my time. I only hoped it would be good enough to qualify for an invitation to state, since I’d missed the winning automatic spot. Brian and I congratulated each other heartily, the mutual respect of competitors beaming through our exhausted smiles. I thought about how he’d beaten me three times my senior year. Then I remembered that I’d done the same to Toby Linton his senior year in 1992, and decided that perhaps I had it coming. That was the last time I swam against Brian Euler. As it turns out, it was also the last time I would ever speak to him. Having been denied victory in my best event, I moved on to my other individual swim, the 100 fly. In preliminaries, I swam to an easy qualifying time, but with no serious competition my time was fairly slow. Originally, I was supposed to challenge Webo’s John Farmer for the first seed, but ended up seeded 4th behind Farmer, Frankfort’s Scott Pearson and Crawfordsville’s Tony Manna. I hadn’t been seeded lower than 2nd in any of my main events all season, so this was kind of a wake-up call. I still thought I could win the race, but being in lane 5 was an unusual position for me and put me at a disadvantage. I could not see Farmer very well, and Manna was completely out of my view, being three lanes over. Nevertheless, the buzzer sounded and we hit the water. I knew almost immediately that I was in trouble. The entire field had shot out in front of me. I wasn’t ready for the pace of this heat. I spent the first 50 yards just trying not to fall too far behind. Entering the back half of the race, we held our seed positions. Farmer, Pearson, Manna and me in fourth. I wasn’t especially tired. My endurance was fine-tuned for this part of the season, so I decided to swim the rest of the race as hard as I could, holding nothing back for the final length. I had nothing to lose. Indeed, as we flipped for the final 25 yards, Scott Pearson had pulled dead even with Farmer, and I had passed Manna (though I didn’t know it). With ten yards to go, Pearson and I continued our pace, and John Farmer struggled to maintain his speed. Scott Pearson won the event, and despite my 2nd half heroics, Farmer stayed just far enough ahead of me to out-touch me by 0.05 of a second. Not half a second – five one hundredths of a second. I had shaved two seconds off my seed time and nearly moved up from fourth place into 2nd place. It was another good time – not quite as good as my varsity record time but very close. Still, 3rd place wasn’t good enough to advance to state. Thus, I had swum my last competitive butterfly event. In the consolation heat of the 100 fly, Adam Spray broke the Lebanon freshman record with an impressive 59.00. It was a sign of things to come. In the 100 freestyle, Mikey Ullom was seeded 2nd and Eric Forrester 3rd behind Webo’s Buddy Willis. The 100 freestyle is the other race that I could have swum instead of the 100 fly, but I chose the latter. Mike was in front of the pack from the very beginning, his long, skinny arms windmilling around and around, and didn’t relent as the race wore on. In the end, he barely out-touched Buddy at the wall, and held one hand on top of his head as in disbelief of what he’d just accomplished, obtaining the automatic state slot. Eric finished 3rd, less than a half-second behind Willis. As I cheered him on, I knew that I probably would have won that race had I decided to compete in it. The winning time was not as fast as the one I turned in at the conference meet, and I was feeling even better on this day than I did back then. Strangely, though, as competitive as I was, I was not jealous of Mikey’s win, nor regretful of my choice. I was seriously excited that he was going to state, and although I hadn’t won any events, I still held out hope that my 200 time would be fast enough to punch my own ticket to Indianapolis. Plus, Mike is the kind of guy that you root for. He was never arrogant or assuming. His excitement for the sport was contagious. He treated me like his brother ever since I met him. He’d been there for me all year. When I was down, but didn’t want to let the team know about it, I’d go to Mikey. 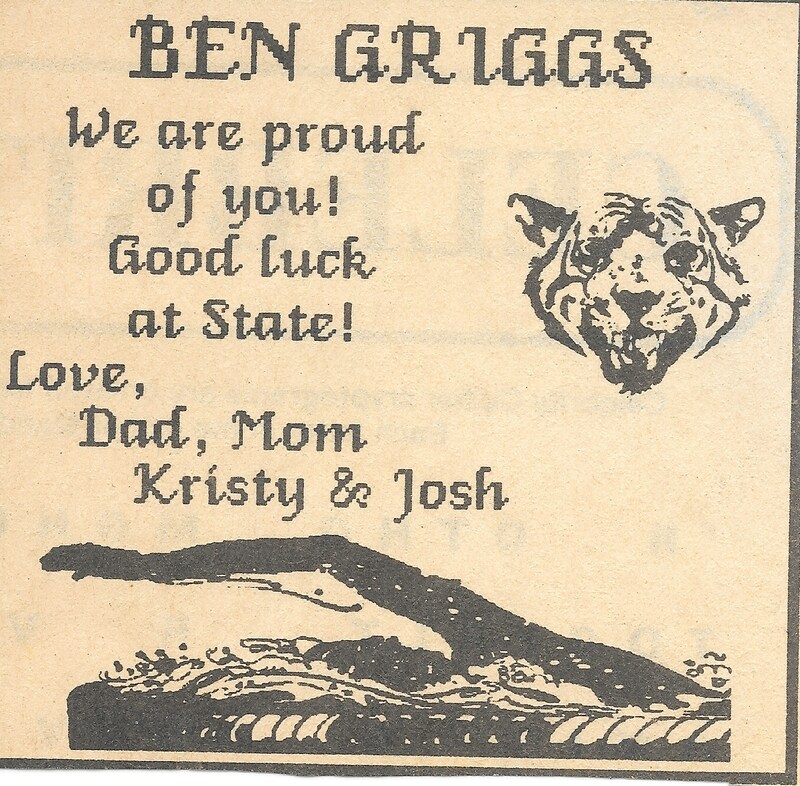 And here he was, in only his second full year of swimming, qualifying for state on his own merit. Up on the podium, his face beamed. I was so happy for him. Because of our relay lineup mistake, our only chances to advance rested with both freestyle relays. 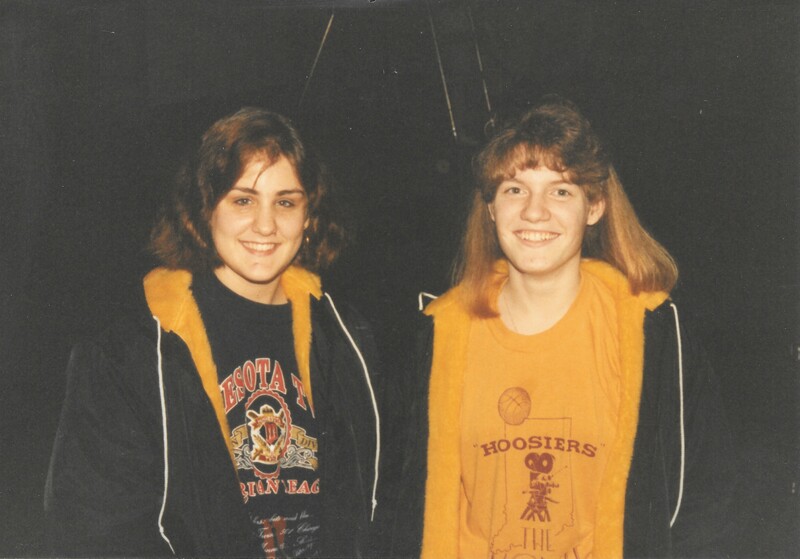 The 200 and 400 had each advanced to state in 1992, but we returned only half of both squads. 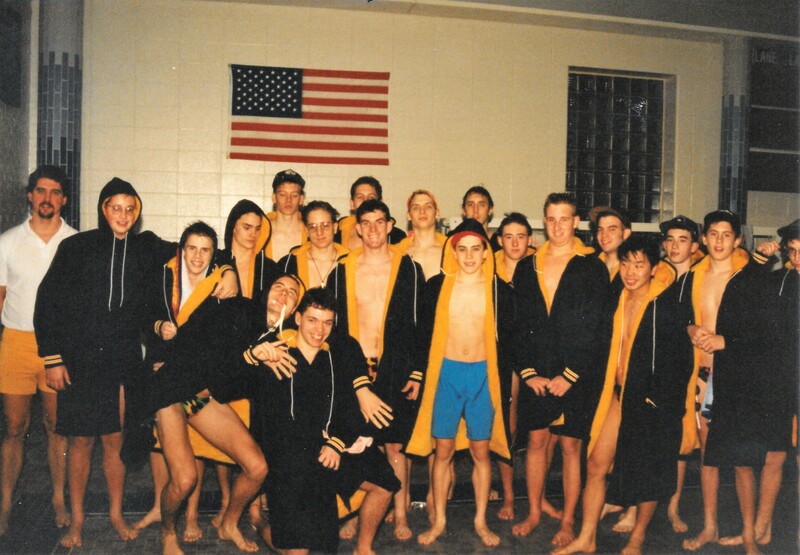 Chris Clay and Mark Ullom, integral pieces in both sectional winning relays in 1992, were gone. In order to put the best pieces together, we’d have to do some shuffling. 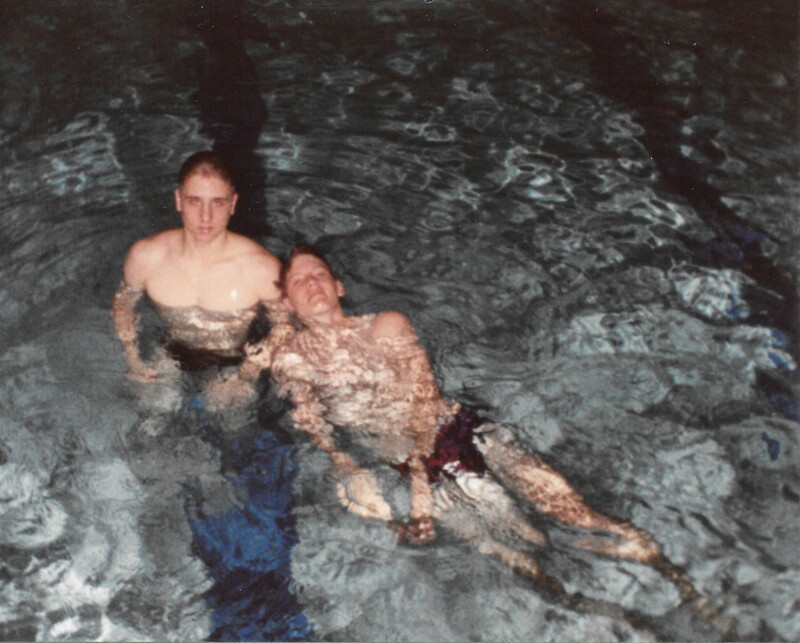 In the 200, Mike Ullom and I returned to the relay that had finished 14th in the state of Indiana the previous year. But unlike in 1992, the 1993 squad didn’t have an abundance of pure freestyle sprinters. Eric Forrester was a strong candidate, but had swum the backstroke leg of the medley, meaning he only had enough eligibility for one more relay. He was slightly better in the 100, so we saved him for the 400 free relay. Junior Matt Chambers, always a feisty competitor and longtime member of the “B” freestyle relay teams, was promoted into the “A” squad for sectionals. Freshman Adam Spray had proven his worth throughout the season and with his quick start, was named the first leg of the both free relays. Despite my 3rd place finish in the butterfly, my confidence was extremely high going into the relays. I’ve described my love for relay races previously, so I won’t re-hash it again. 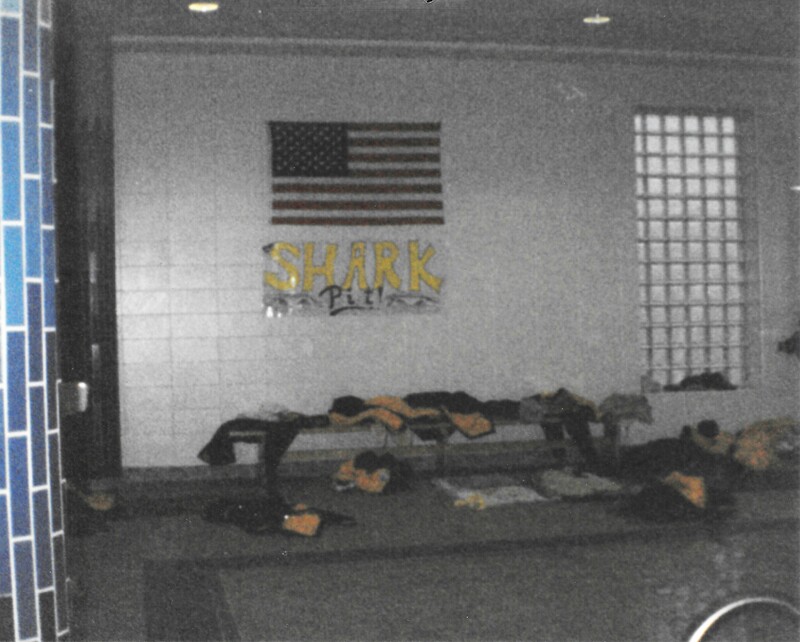 I knew that if we didn’t perform well, this would be the last time I would ever swim a relay as a Lebanon Tiger Shark. I won’t recount each leg of the relay, but every member fought hard. In a less than ideal situation, we managed a 2nd place finish, unable to overcome an insurmountable Webo lead. I even moved us up a spot with my anchor leg, as I passed the team from Frankfort in the final stretch. In a last, desperate attempt to qualify a relay for state, we slotted Adam, Mikey, Eric and myself into the final event of the meet, the 400 freestyle relay. With our qualifying time, we were seeded less than a half-second behind Western Boone, and based on how good I’d felt in the 200 free relay, I was supremely confident that I was going to win this relay if we were anywhere close to them when it came my turn to swim. It didn’t matter that I hadn’t won an event all day. It didn’t matter that I would be swimming against their best sprint freestyler. The only thing that mattered was that this was my last relay, maybe ever, and I was going to go out with a bang. Adam started us off with an outstanding effort. He was quick off the block but fell behind many of the other teams early. Once he got his pacing straightened out, he kicked it into high gear and fought back to a close 3rd place. Unfortunately, Adam was a freshman (and a small one), facing a much larger and more experienced field. Western Boone opened up a huge 2 and a half body-length lead on us by the time they finished their first leg of the relay. Mikey swam next, and moved into 2nd place, passing Frankfort, almost immediately. He continued to widen that gap and made up nearly a full body length on Webo. He wasn’t quite at their feet when they finished their 2nd leg. Eric swam next for us, and looked to be gaining some ground initially, but by the end had mostly held our position steady. I saw the Webo anchor take off from the block in my peripheral vision. I was still zeroing in on the exchange for what felt like an eternity. In reality, it was about two and a half seconds, which doesn’t sound like much time, but it’s a fairly big deficit to inherit. I didn’t care. I knew my team had swum as hard as they could, and now it was my turn to shock everybody who had chosen to stay and watch the end of the meet. Watching the video is still entertaining for me. The crowd noise continues at a low, constant murmur until the final 25 yards of the race, when it becomes apparent that I’m gaining ground. I went into the final turn behind his feet. Then, I flipped and came out at his ankles. At the halfway point, I was at his waist and still gaining. At this point, the Lebanon crowd starts to cheer loudly, hoping to see one final comeback to cap a career of surprise victories. Unfortunately, though I made a lot of Webo fans very nervous, I simply didn’t have enough pool left to overtake the Stars’ anchor. After digging out of a nearly three second hole, I was out-touched by Western Boone by less than a half-second (0.40 of a second, to be precise). I looked up at the clock. Then, adrenaline still surging, I have Mikey a high-five that nearly took his hand off. Afterwords, I hung exhausted from the lane line, and exchanged congratulations with the Webo anchor (I think it was Brad McMahan). I was satisfied with the swim, and hopeful that perhaps our time would be good enough to make the state cutoff. It wasn’t, as we would learn later. I was officially done swimming relays. Adam, Eric, and Mike were my final relay team. I found this appropriate in that these were three relay team members who I had the most confidence in, and the three who I always knew would put forth their best effort. In a year of finales, this was one of the toughest to swallow. Although I had a strong sectional, and swam some of the best times of my career, I didn’t win any races. Three second place finishes and a third was not the way I’d hoped to end my career, though I was hard pressed to figure out how I could have done better. The season ended much like it had began. Webo was too stacked, the competition too strong. They’d beaten us four straight years. They’d won Sagamore Conference four straight years. They’d won sectional the three years since we’d moved into it. Most of their success over the last four years had been built on the strength of their senior class – my class. As a senior, I had caught myself on a few separate occasions gazing across the pool deck at the ten talented Webo swimmers in my class, then thinking to myself “I’m just one guy. How can I hope to beat them?” Of course, I wasn’t alone. I was extremely proud of what our team accomplished. We came in 2nd place at both conference and sectionals, won 13 dual meets, won our own invitational, and broke 3 varsity records – all with only one four-year senior. But I always wanted just a little bit more. One conference championship would have been fine. I would have even settled for a dual-meet win against them, something! But that chance had passed. This season was in the books. Correction: this season was almost in the books. Mikey was the only swimmer from Lebanon to get an automatic bid to the state swim meet with his win in the 100 freestyle. Coach Lohsl stopped me in the hallway the Monday following sectionals. He had good news and bad news. The good news: my 200 freestyle time was fast enough to earn me a spot at the state meet. Mikey and I were both going for the second year in a row! The bad news: the relay time was not good enough, so Mikey and I would be leaving the rest of the team behind to compete down in Indianapolis. Now, I was even more elated that Mikey had won his event. Being the only swimmer from Lebanon to qualify for state would have been very difficult. We began our odd pre-state week of practice in a mostly empty pool, doing our best to stay loose but not overextend ourselves. Occasionally, other swimmers from the team would show up to work out with us and provide support. I’m pretty sure Matt Chambers was there nearly every day. We did our best to try not to think too much about the upcoming race, lest we expend all of our adrenaline ahead of time and leave ourselves exhausted. I was fighting off a cold, or perhaps a small sinus infection brought on by my sensitivity to chlorine. This being my senior year, I had decided to shave my head completely bald for the first time. This caused a bit of a stir in a small, conservative town like Lebanon. Making matters worse, another student in my class had decided (for reasons still unknown to me) to shave his head at the exact same time, providing the appearance of some kind of outbreak or conspiracy. I can remember sitting in Mr. Haw’s physics class when another staff member from the science department walked into his room to speak with him. I was never a very big fan of this particular teacher, as she seemed to think rather highly of herself, and not very highly of her students. Luckily, I never took any of her classes. As she strode in, her eyes caught sight of my bald head. Her first order of business with Mr Haw was to lower her voice and glance in my direction, formulating some secret question that I will never know. Knowing that she was talking about me, I started to slink down into my seat. Mr. Haw, also our assistant swim coach, replied loud enough for the entire class to hear “Well, I don’t know about that, but he“, he nodded in my direction, “is going to be in the state swim meet this weekend!”. Rebuffed at her attempt to gossip, unnamed science teacher straightened her back and resumed a professional demeanor. As she turned to walk out, I thought I saw a slight grin on Mr. Haw’s face. His eyes floated back to me, and I couldn’t help but smile, myself. Mikey, Mr. Lohsl and I rode down to Indianapolis following school on Friday. The feeling this year was much different. Being only two of us, the hi-jinx were kept to a minimum. We touched up each other’s haircuts, and went to sleep. We woke up early for warm-ups, and were greeted by the familiar sound of hundreds of Indiana’s best athletes starting, turning, splashing and drilling in the beautiful IUPUI natatorium. This was my third year at the state meet (2nd competing), and the sights and sounds had gained a sort of familiarity. Although never a sure thing, I had begun to expect a trip to state each year. Considering that this was the culmination of my four years of swimming, I was pretty calm, albeit determined to have a better showing than the previous year when I’d finished 29th. As the heats for the 200 freestyle were called up, I maintained my focus. Even as I stepped up onto the block, I felt the familiar, slow controlled burn of adrenaline begin to heat up. It’s easy to psyche yourself out for a big race. It’s sometimes difficult to find the balance between swimming your own race (doing what’s worked all season) and figuring out how to do it all even better, faster than you’ve ever done it before. As instructed by the starter, we all came down together to take our mark. Then, I flinched. The starting buzzer sounded, and my entire heat dove into the pool. Wait, I flinched. Did they see me? My mind raced back to last year, to our relay disqualification. The official didn’t tell us that we had false started until after the race was over. But individual events didn’t work that way, did they? They’re supposed to drop the rope halfway down the pool if somebody false starts, remove the offender, and begin the whole race over again. But this was state – did they do it differently here? These were the thoughts dancing through my mind as I swam the first 25. As many swim meets as I’d been to over the last six years, I already knew how disqualifications worked. Realizing that I’d flinched before the buzzer had sent me into a slight panic and caused my thoughts to betray me. When I executed my flip turn at the 50 yard mark, I had finally convinced myself that I hadn’t been disqualified, but by that point my race had already been thrown off. I dug deep, but at the state swim meet, there is no margin for error, and I never fully recovered. My time was not great, over two full seconds worse than my sectional swim, and not good enough to improve on my seeding. For the second year in a row, I finished 29th in the state of Indiana in the 200 freestyle. It wasn’t what I was hoping for, but considering my flinch at the start, my career could have had a much more tragic ending. I hoisted myself out of the pool, suddenly aware of how exhausted I was. I slowly wandered over to the warm-up pool, and allowed my momentum to carry me back down into the water. As the cool liquid engulfed me, it felt as if it were washing away what remained of my swimming career. The pain of practice, the low carb diets, keeping the team focused and together, the early mornings, proving myself again and again, the lack of sleep, the lack of oxygen, representing minority sports in a basketball town, all of it seeped out of my pores, permeating the crystal clear waters of the Natatorium, and eventually dissipating away. When I emerged from the warm-up pool, I was a different person. I was no longer a high school swimmer. And in that moment, I breathed a heavy, somewhat wistful sigh of relief. At the post-season awards, I was humbled that my teammates voted me both Most Valuable Swimmer and best Mental Attitude. I think I was the first swimmer to win the mental attitude award twice. I still have the trophies. They meant a lot to me because they were given to me by the team, and not something I had earned in competition. It was great to be together one last time as a team, considering my last swim meet was just me and Mikey down in Indianapolis. But in some ways it was a little tough, too. Much of the conversation (besides the joking around and trash talking each other) revolved around how well the Lebanon Tiger Sharks would perform next year, when they were sure to be conference favorites. It was an exciting prospect, to be sure; the opportunity to be the first team in school history to win Sagamore. But that path was not for me. When the evening had concluded. we didn’t say goodbye. Mostly because it doesn’t occur to you in the moment that this will be the last time you’re all in the same room for a very long time…possibly ever. This is especially true when there’s still a good portion of the semester remaining, knowing that you will still pass one another in the hallways several more times before the end. Saying goodbye would have seemed like an over-dramatic gesture. But in a sense, I said goodbye to a lot of things that night. I said goodbye to my team, my coach, my high school identity, and one of the only things I’ve ever truly excelled at in life. I took a lot with me, too: the aforementioned trophies, a senior captain rank, a most improved award, six varsity school records, six first team all-conference plaques, five second team all-conference certificates, three sectional wins, two sectional records, three state qualifications, two top-30 state finishes and one All-State honorable mention. Not bad for a chubby little “new kid”. Besides accomplishments, I walked away with amazing experiences, memories, and lifelong friendships. I walked away knowing that I had given the Lebanon Tiger Sharks everything that I had to give, and somehow they still ended up giving me more. My senior year was an interesting time. I knew that one chapter of my life was closing, but compared to the excitement and anxiety of moving on to the next phase, I think the significance was somewhat lost on me. At the same time, the burdens of expectation and leadership had just been lifted, so sadness was overshadowed by relief. Almost an entire year would pass before I began to seriously consider swimming once again. Who said I had a slow start? First one in the water off the block! Swim party at my house! 1993 Cedars yearbook. My freshman year, we shared one page with the girls team. By my senior year, we warranted two full pages! This blog post contains real names of people who were a part of my swimming story, some of whom are probably reading this post. I tried to think of a way to tell my story without using names, but found it impossible. The people are just too important to the story. It is not my intention to misrepresent anybody, but if you were there, and you disagree with my depiction of events or characterizations, I apologize. I blame it on the distortion that occurs to certain memories seen from a singular point of view over 20 years ago. Thanks for reading it, James! I agree, good times!